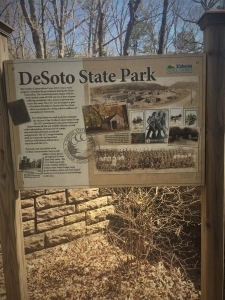 March 20, 2019, staff at DeSoto State Park (DSP) welcomed members of my Osher Lifelong Learning Institute (OLLI at University of Alabama in Huntsville) winter term course on Northern Alabama State Parks. The 35 or so registrants elected to visit DSP on this supplemental field trip from among the Parks we brought to OLLI during the six-week term. And what a great day we chose to visit — perfect weather on the first day of spring! I intend for this Blog Post to hit a few highlights and celebrate the course and this capstone field tour. 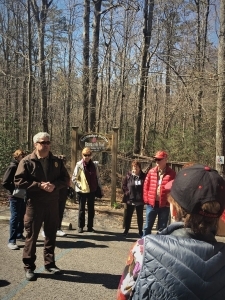 Park Superintendent Ken Thomas oriented us at the entrance to ADA-accessible Azalea Cascade Boardwalk Trail, and then led us back to the cascade. I will not attempt to identify folks in the photos, except for Ken in the uniform below. Three months of more-than-ample rain assured good flow in every spring, brook, and creek. Full sun reached the forest floor in advance of the leaf-out yet to arrive. One of our classmates paused to absorb the sun, lean on one of the many rock ledges, and enjoy Nature’s bounty. Moss and lichen find purchase on most every surface, transforming tree trunks and raw rock to elevated non-flowering plant gardens. I admit that as a former wood products industry forester, I still see trees in terms of merchantable height, board feet, and sawlog quality, but not exclusively or even primarily. I saw a different kind of quality in the white oak below. Imagine with me, if you will, the oak as a sapling struck by a larger nearby tree falling on it, bending and breaking it 20-feet above the ground. The sapling sprouted above the break, growing once again skyward. 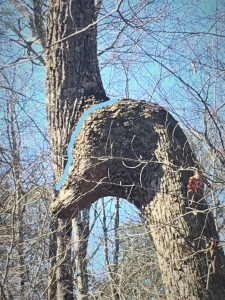 Now 50 years later, the sapling has developed a nearly perfect goose head! Artistic quality in this fine feathered oak far exceeds the tree’s worth for forest products. Notice the bill closed tightly and the eye located anatomically exactly where it should be! The upper neck is flawless. I pledge to never jettison the timber beast that lies within me or abandon my youthful zest for tree whimsy. Spring ephemerals had begun to awaken, taking seasonal advantage of the full sunlight flowing through the still leaf-free canopy. 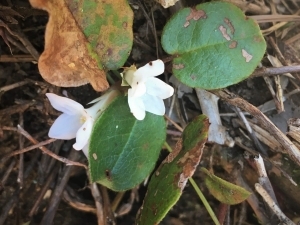 Trailing arbutus (Epigaea repens) blooms from last year’s foliage (lower left), as does solitary pusseytoes (lower right; Antennaria solitaria). And we saw the refreshing spring yellows of halberd-leaved violet (lower left; Viola hastata) and trout lilly or yellow fawn lilly (lower right; Erythronium americana). Common names are often so descriptive. Pusseytoes flowers resemble a cat’s paw. 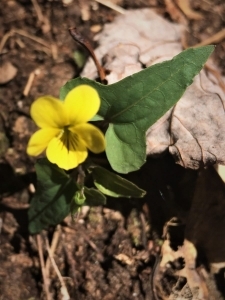 The yellow violet leaf is, quite simply, halberd-shaped. 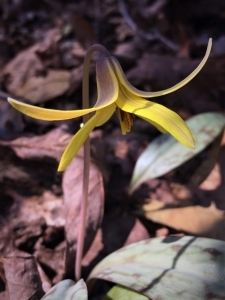 The yellow fawn lilly leaves are spotted like a new spring fawn! 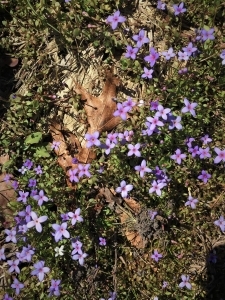 And bluets (Hedyotis caerulea) could not be more aptly named. White, yellow, and blue replacing the drab cloak of winter. Yet another reason to celebrate! Indian Falls, a short walk from the Cascade Trail head, supplied visual and audio reward as it dropped perhaps 20 feet over a rock ledge. Because I was there to shepherd our OLLI flock, I chose to capture our enrollees enjoying the falls from both above and below. Early in my professional life, I would have thought that retirement was for the aging (maybe even the aged), and that heading into the woods beyond a stroll in the garden was for other than those deep into their seventh and eighth decades (60s-and-70s year-old ancients). By definition and from the website, “OLLI at UAH is designed specifically for your lifestyle and interests, with no grades or tests. Become an active member of OLLI today! … OLLI is designed for lifelong learners age 50+ seeking intellectual stimulation, self-expression, and the opportunity to explore new ideas with peers.” While OLLI invites lifelong learners 50-60, most everyone in my course can see that decade only over their shoulders. None among us thought about our age that day. Sure, although we ventured forth on a fine spring day, I no longer feel the spring in my knees. Yet, like the expanding leaf and flower buds, I felt my heart and spirit swell with the season. In fact, at this age of chronological seasoning (aging), I feel the Nature-inspired surge of life within me more now than ever! Aldo Leopold offered a quintessentially relevant quote: “When I call to mind my earliest impressions, I wonder whether the process ordinarily referred to as growing up is not actually a process of growing down; whether experience, so much touted among adults as the thing children lack, is not actually a progressive dilution of the essentials by the trivialities of living.” So true, especially now 70 years beyond his offering that insight, as we Homo sapiens in modern society too often abandon the essentials in pursuit of our digitally-based trivialities of living. 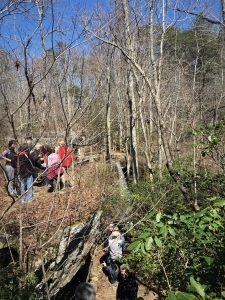 March 20 at DeSoto, we stayed with the essentials, immersed in Nature’s beauty, magic, wonder, and awe. We observed, appreciated, and relished the experience through the eyes, heart, soul, and spirit of youth. Perhaps retirement marks a threshold from which we grow up… and re-enter the world of essentials! I observed our group of OLLI participants remaining aware and going blind only to the distractions and trivialities of living. I think that to a person we relished the day together… with Nature and with each other. I’ve quoted John Muir multiple times — his wisdom is timeless: “In every walk with Nature, one receives far more than he seeks.” We all appreciated the indoor elements of the six-week course as we brought the Parks to the classroom, but nothing matched the exquisite gifts we received from our visit to DeSoto State Park. Another of Muir’s gems of Nature rewards and benefits: “Keep close to Nature’s heart… and break clear away, once in a while, and climb a mountain or spend a week in the woods. Wash your spirit clean.” We spent far less than a week, yet performed a bit of spirit-cleaning! 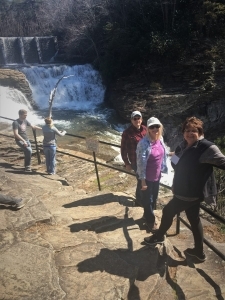 Most of us made a fitting side trip to nearby DeSoto Falls. Yet another treat — nothing of lesser worth here! And also nearby, a human history and archeological jewel: Howard’s Chapel and cemetery. The Chapel, wedged into and built alongside a fifteen-foot sandstone ledge that serves as a backdrop for its pulpit, was built in 1937 by “an obscure former Hollywood lead man and candidate for U.S. President.” A curiosity that is somewhat whimsically spiritual. We are one with Nature, in life and in death. Ashes to ashes… dust to dust. 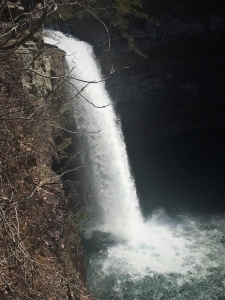 Howard, I am certain, viewed the nearby falls with deep appreciation and felt the Spirit move in him 80 years ago. 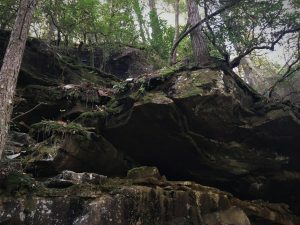 How many generations of Native Americans sensed a strong spiritual connection to this land now protected, managed, and preserved as one of Alabama’s 22-pearl necklace of State Parks? I am honored and privileged to have co-taught this OLLI course with the Park System’s Northern Alabama Operations and Maintenance Supervisor Tim Haney. Tim knows the Parks and exudes a reverence for them that infused every presentation and interaction. I am grateful for the essential and pivotal role he played. Retain the youthful innocence and child’s appreciation for Nature’s beauty, magic, wonder, and awe. 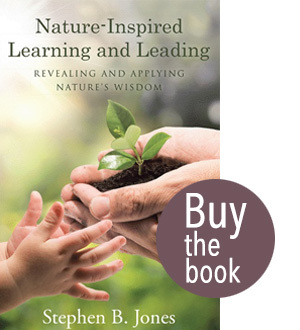 I wrote my books (Nature Based Leadership (2016) and Nature-Inspired Learning and Leading (2017)) and the two scheduled for 2019 (Weaned Seals and Snowy Summits: Stories of Passion for Place and Everyday Nature and Natural Elixir: Lifting Your Life through Nature’s Inspiration) to encourage all citizens to recognize and appreciate that every lesson for living, learning, serving, and leading is either written indelibly in or is powerfully inspired by Nature. Both published books are available on Amazon and other online sources. Life will reward those who keep close to Nature’s heart. An ounce of Nature’s essentials outweighs a ton of digital distractions and trivialities. Grow up without shedding awareness. Inhale and absorb Nature’s elixir. May Nature Inspire and Reward you! Mission: Employ writing and speaking to educate, inspire, and enable readers and listeners to understand, appreciate, and enjoy Nature… and accept and practice Earth Stewardship. People of all ages will pay greater attention to and engage more regularly with Nature… and will accept and practice informed and responsible Earth Stewardship. They will see their relationship to our natural world with new eyes… and will understand more clearly their Earth home. Tagline/Motto: Steve (Great Blue Heron) encourages and seeks a better tomorrow through Nature-Inspired Living! 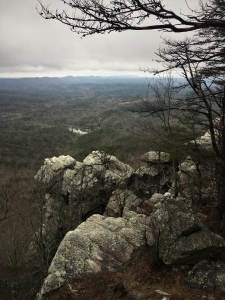 This is the fourth and final post from my February 28-March 2 visit to Cheaha State Park. I joined some 120 environmental educators attending the annual meeting of the Environmental Educators Association of Alabama (EE AA). The group invited me to present the opening keynote address Thursday evening (2/28). I stayed for the entire conference, enjoying it immensely. 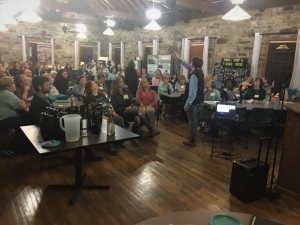 My first EE AA meeting post provided a broad conference and Cheaha overview: http://stevejonesgbh.com/2019/03/05/magic-and-wonder-on-the-mountain-an-inspiring-conference-at-cheaha-state-park/ (Magic and Wonder on the Mountain: An Inspiring Conference at Cheaha State Park). 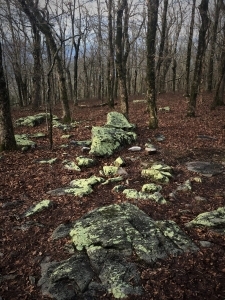 My second EE AA blog post explored a conflicting set of reactions and reflections to something we observed from the Rock Garden overlook during an interpretive hike: http://stevejonesgbh.com/2019/03/11/scars-upon-the-land-thoughts-stirred-by-a-view-from-cheahas-rock-garden/. 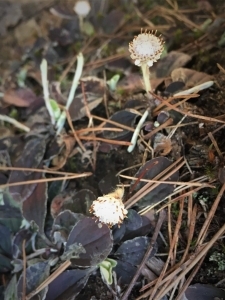 The third post presented the exhilarating diversity of non-flowering plants I encountered during the limited time I ventured outdoors at Cheaha in intermittent rain and nearly continuous fog: http://stevejonesgbh.com/2019/03/20/non-flowering-plants-atop-the-mountain-at-cheaha-ee-aa-annual-conference/. This post summarizes and highlights my keynote address: Seeing and Translating Nature’s Infinite Storm of Beauty. One hundred thirty years ago John Muir wrote, “When we contemplate the whole globe as one great dewdrop, striped and dotted with continents and islands, flying through space with other stars all singing and shining together as one, the whole universe appears as an infinite storm of beauty.” I love the phrase, the ultimate descriptor of my own sentiments toward Nature. I believe that Muir, as do I, viewed the infinite storm of beauty as both literal and metaphorical. For the first time in my life I have written an actual self-mission statement: Employ writing and speaking to educate, inspire, and enable readers and listeners to understand, appreciate, and enjoy Nature… and accept and practice Earth stewardship. Ironically, I discovered as I prepared for the keynote, that EE AA’s mission is uncannily similar: Our mission is to enhance the abilities of formal and informal educators to connect people to the natural world in order to foster responsible stewardship. I had come to the right group to share my message to encourage and seek a better tomorrow through Nature-Inspired Living! 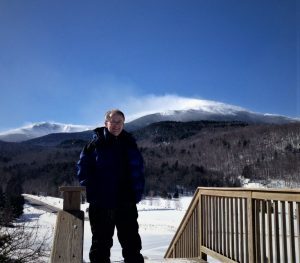 I related one such literal storm of beauty, from my first book, Nature Based Leadership, describing my attempt to summit New Hampshire’s Mount Washington, New England’s highest peak at 6,288-feet (January 2015). The lower elevations, covered in dense northern hardwood and white pine forests, held a two-foot snowpack. Scudding clouds, brisk breezes, and upper teens greeted us at the base (perhaps 1,500-foot elevation). We could see Washington’s east face to 4,500-feet clearly. Just three days before my address, friend and colleague Will Broussard, who serves as Director of Education at the Mount Washington Observatory emailed me, “Update: We’ve reached 171MPH!! New Feb record! 8th windiest day in history! Highest winds in 33 years! So lucky and terrified to be on the summit right now.” Will and I had spoken more than once about what I call Pleasurable Terror! How strikingly similar that he referred to his experience February 25, 2019 as combination good fortune and terror — an infinite storm of beauty! 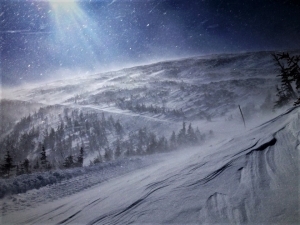 The ambient air temperature that afternoon on Mt Washington reached a high of only 14 degrees Fahrenheit below zero! Or a lone slash pine silhouetted against a squadron of cirrus puffs at Gulf State Park (lower left). Nature’s magic and wonder take infinite shape and form. Lying on my back I captured cypress crown shyness above me on the boardwalk at Wheeler National Wildlife Refuge (WNWR; lower right). Like so many of us humans, we stand in our work-a-day worlds seeming shoulder to shoulder, yet never touching beyond the superficial. Crown shyness is both metaphorical and magically aesthetic, rich in magic and wonder in many dimensions. Magic and wonder bless all seasons and every location we have called home, from winter-burdened (and decorated) spruce along the Chena River in Fairbanks, Alaska (lower left) to our narrowing driveway in West Chesterfield, New Hampshire (lower right). To summer sunset in my Madison, Alabama neighborhood (lower left) to fall-planted longleaf pine bordering a Greenway and a cotton field near my current home (lower right). John Muir wrote, “In every walk with Nature one receives far more than he seeks.” Aldo Leopold observed, “Land health is the capacity for self-renewal in the soils, waters, plants, and animals that collectively comprise the land.” The cypress swamp (lower left) and flooded fields (lower right) near the WNWR visitors center corroborate Muir and Leopold’s wisdom. Nature’s infinite storms of beauty know no bounds. Wendell Berry offered his own variation on Nature’s infinite storms of beauty, “Outdoors we are confronted everywhere with wonders; we see that miraculous is not extraordinary, but is the common mode of existence. It is our daily bread.” A reality expressed below in two fall images at Camp McDowell and Conference Center. And on that same McDowell visit, a frosty morning field and a glorious fall afternoon at an interior beaver pond. 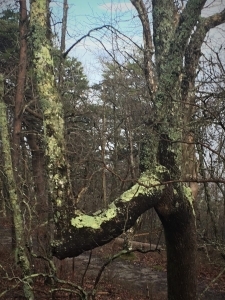 Storms of beauty also come at many scales, from a lichen festooned musclewood (lower left; Carpinus carolinia) to a rain-water-soaked American beech (lower right; fagus grandifolia). I could have gone on for scores more examples! Nature is indeed a source for infinite storms of beauty! My EE AA audience agreed. I reminded all of us that we are beauty-storm-stewards. Carl Sagan implored us some 20 years ago to recognize that we are alone on a mote of dust, a pale blue orb in the vast darkness of space. That no one will come from without to save us from ourselves. The burden of absolute responsibility is ours alone. “We reached the old wolf in time to watch a fierce green fire dying in her eyes. I realized then and have known ever since that there was something new to me in those eyes, something known only to her and to the mountain. I was young then and full of trigger-itch; I thought that because fewer wolves meant more deer, that no wolves would mean hunters’ paradise. But after seeing the green fire die, I sensed that neither the wolf nor the mountain agreed with such a view.” For Leopold, a life-changing moment. What is yours? All of Leopold’s land ethic quotes correspond to my mission and EE AA’s. We are at one with Leopold. That leads me to my own purpose and passion. May 3, 2012, while taking an evening stroll in Urbana, Ohio, where I served as President, Urbana University, a motorist ran a stop sign as we were crossing an intersection, plowing into us and catapulting us scores of feet forward. We recovered, vowing to recognize that life is fleeting and fragile, and committing to make a difference with the remaining years of our lives. Novelist and playwright Bernard Malamud had the lead character in The Natural (his book and the resultant movie) say, “We have two lives to live. The one we learn with, and the one that comes after that.” Alabama’s own Helen Keller said, “Life is a daring adventure, or nothing.” And finally, Horace Mann, the mid-twentieth century education scholar, said, “Be ashamed to die until you have won some victory for humanity.” I offer these quotes to buttress my personal mission statement (my second life; my daring adventure; my victory for humanity): Employ writing and speaking to educate, inspire, and enable readers and listeners to understand, appreciate, and enjoy Nature… and accept and practice Earth stewardship. Discovering, Revealing, and Celebrating Nature’s Infinite Storm of beauty, magic, wonder, and joy! May We Rise to the Challenge! May this continue to be our Daily Bread! May we all leave a Legacy! In every walk with nature one receives far more than he seeks (John Muir). There is indeed magic and wonder atop the mountain… and everywhere in Nature we choose to look. Wendell Berry: In Nature we see that the miraculous is not extraordinary, but is the common mode of existence. Great Blue Heron clients will see their relationship to our natural world with new eyes… and will understand more clearly their Earth home. Tagline: Steve (Great Blue Heron) encourages and seeks a better tomorrow through Nature-Inspired Living! 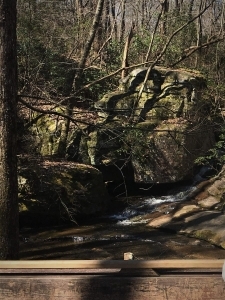 This is the third of what will be four posts from my February 28-March 2 visit to Cheaha State Park. I joined some 120 environmental educators attending the annual meeting of the Environmental Educators Association of Alabama (EE AA). The group invited me to present the opening keynote address Thursday evening (2/28). I stayed for the entire conference, enjoying it immensely. 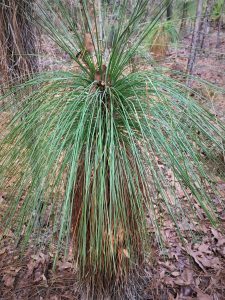 This blog post presents the exhilarating diversity of non-flowering plants I encountered during the limited time I ventured outdoors at Cheaha in intermittent rain and nearly continuous fog. In the fourth post I will summarize and highlight my keynote address: Seeing and Translating Nature’s Infinite Storm of Beauty. 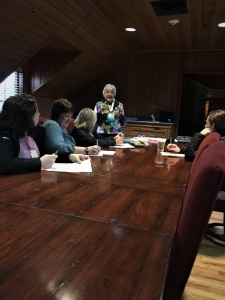 My first EE AA meeting post provided a broad conference and Cheaha overview: http://stevejonesgbh.com/2019/03/05/magic-and-wonder-on-the-mountain-an-inspiring-conference-at-cheaha-state-park/ (Magic and Wonder on the Mountain: An Inspiring Conference at Cheaha State Park). 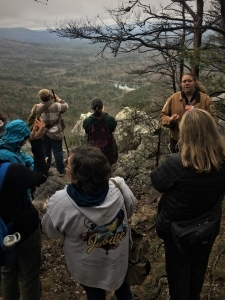 Last week’s blog post explored a conflicting set of reactions and reflections to something we observed from the Rock Garden overlook during an interpretive hike: http://stevejonesgbh.com/2019/03/11/scars-upon-the-land-thoughts-stirred-by-a-view-from-cheahas-rock-garden/ . I begin with a caveat; I am a tree guy. 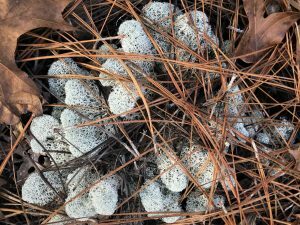 I fully understand the role that non-flowering plants play in our Alabama forests, yet I am convincingly inept at identifying beyond the simple characterization among lichens, mosses, and fungi. I can tell you that I took all of the photos in this post atop Mount Cheaha above 2,000 feet. The two below are views to the WNW (lower left) and N (lower right) from the Rock Garden and Bald Rock, respectively, snapped during one of two times when the views were not cloud- and fog-obscured. Conditions atop Cheaha are harsh (wind and ice storms). Virginia pine (Pinus virginiana) and chestnut oak (Quercus prinus) dominate the upper elevation forest. Individuals are often battered and broken. 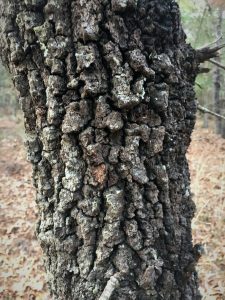 Non-flowering plants colonize virtually all bark (dead and living trees) and stone surfaces. Cloudy skies following a rain-soaked morning seemed to intensify the lichen color and contrasts. 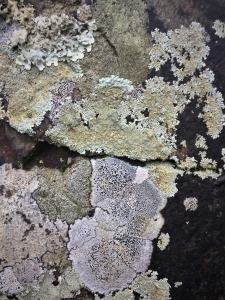 In fact, the lichens brought vibrancy to the otherwise overwhelmingly drab and dormant scene. Not just color, but intricate, delicate, and masterpiece-grade patterns, textures, and species admixtures. As I sorted these images I wondered whether anyone has assembled a coffee table quality collection of photographs (taken with a camera several quality steps above my iPhone), complete with detailed identification. I see and appreciate the exquisite beauty, yet that simply reminds me how little I know about these magnificent living organisms. As I enter my second year beyond full-time employment (believe me, university CEO gigs demand 24/7! ), I am learning continuously, even as I am constantly learning how little I know about so many things that draw my interest. Non-flowering plants among many such topics. 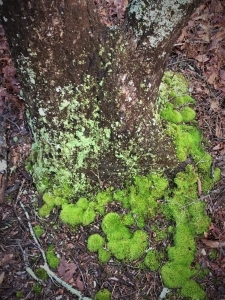 I am not sure, for example, whether the darker green (lower left) is a moss or alga. I believe the rock at lower right supports both crustose and foliose (at top of photo) lichens, with at least two species of the latter. I fear my knowledge is a millimeter deep and kilometers wide. The foliose lichen below could be a toad skin lichen, one of the rock tripes, yet don’t take that as a firm identification! Or is it possibly a liverwort? 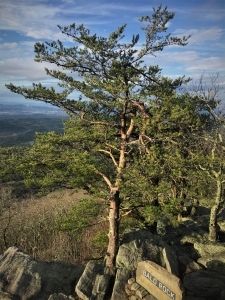 Regardless, I find great fascination in examining the non-tree, non-flowering plant life atop Cheaha. 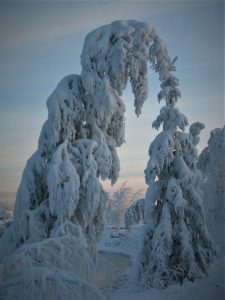 I mentioned the tortured tree forms, savaged by exposure and ice storms. These chestnut oaks epitomize their tough existence. Although one is a ‘V’ and the other a ‘4,’ both play host to lichen cloaks. Again, how drab they would be without their lichen garb. 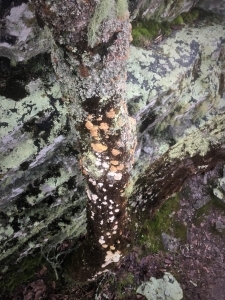 I presume the fructose lichens below represent two species of distinct coloration. 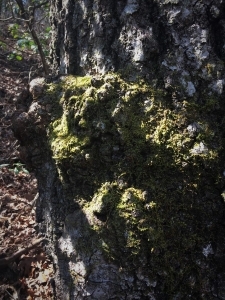 I’m also surmising that very slow tree growth and frequent moisturizing fog keep the lichens vibrant. 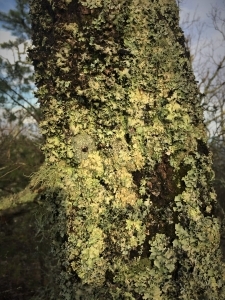 Slow-growing trees severely minimize the rate of bark shedding, allowing lichen colonies to reach greater thickness and extent. The tapestry of life begs inspection, study, and learning. The stem at lower left presents, again, both crustose and foliose. 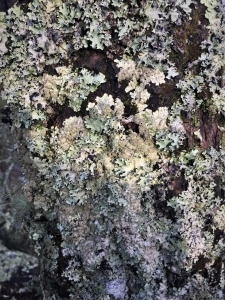 The old branch stub (lower right) reminds me of a ram’s head adorned in its lichen fur. Lichen in combination with moss increments the aesthetic factor, in my view, a minimum of an order of magnitude. 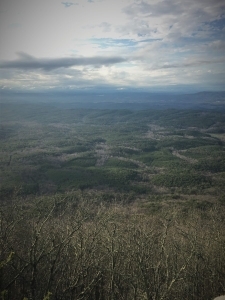 The wise person who first observed that nature abhors a vacuum could have been hiking atop Cheaha! Imagine, a bare rock providing such security, anchorage, and nourishment to a living work of art. 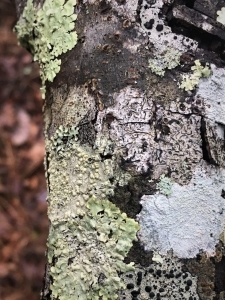 Our 11-year-old Alabama grandson said the lower left image appeared to him as a mountain lake (lichen) surrounded by deep forest (moss) sloping away. I can’t argue with his perspective. A true nature enthusiast must have a vivid imagination and be willing and able to see the beauty, magic, wonder, and awe hidden within. “The power of imagination makes us infinite” (John Muir). 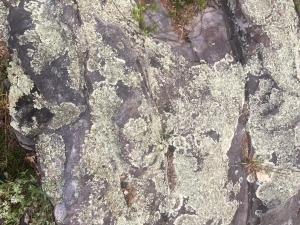 Reindeer and crustose lichen and moss populate the rock island (lower right). I considered what adventures (and dangers) I might encounter on the island if reduced to one-inch height. 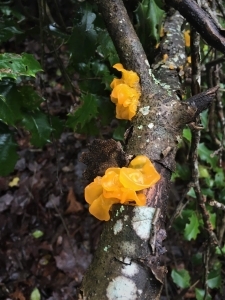 What a treat to find witch’s butter (Tremella mesenterica) on a dead pine branch. 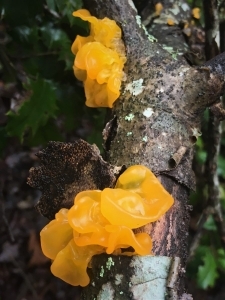 This orange jelly fungus, like all the mosses and lichens proliferating atop Cheaha, seemed to relish the wet conditions. 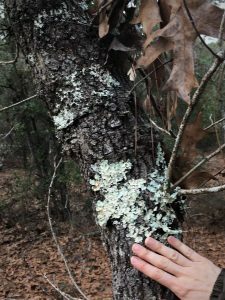 A non-flowering plant specialist could spend hours examining and inventorying the life-richness occupying the standing dead oak sapling and the rock ledge: beard, foliose, and crustose lichens, little tan fungal bodies, and moss. A macro lens in capable hands (with expert knowledge) could reveal mysteries and magic far beyond my simple (and ignorant) aesthetic admiration. Even we Nature enthusiasts too often focus at landscape scale, seeing only the hills and forests. We sometimes don’t see the trees for the forest, a flip on the old saw about not seeing the forest for the trees. 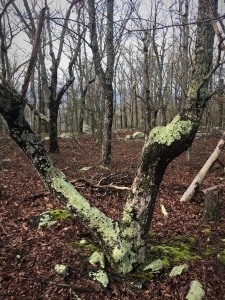 And within the forest we may restrict our sight to the trees, missing the richness, for example, of Cheaha’s incredible palette of non-flowering plants. Imagine the poor soul who stops at the lower elevation scenic overlook (below) and has no hint of the diverse forest life within the forest captured by the few frames within this post. What would I have discovered if I had visited the Park, expecting blue skies and unlimited vistas, and bemoaned the rain and fog. My assumption is that we had few such disappointed visitors among my environmental educator colleagues. They represent the choir of Nature’s sanctuary. Their mission, and mine, is to spread the word and convert more citizens to understand, appreciate, and enjoy Nature… and accept and practice Earth Stewardship. 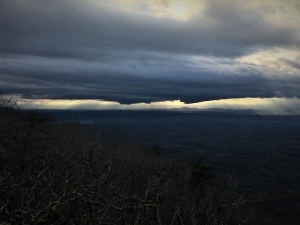 I witnessed and enjoyed spiritual lift from the grand scale (sunset the first evening on Cheaha below) to the witch’s butter on a dead pine branch to the cushion moss fish on the floor of an otherwise drab and colorless, bruised and battered stand of chestnut oak. I urge all would-be naturalists and Nature enthusiasts to open your eyes and seek the beauty, magic, wonder, and awe that lie hidden within. To those willing to seek, Nature offers unlimited reward. “There’s gold in them thar hills” (Mark Twain), but not of the spending kind. The gold I saw is the inward-investing kind. Gather it through all five portals (body, mind, heart, soul, and spirit), store it internally, and harvest the dividends of enjoyment, satisfaction, and fulfillment! So much of Nature’s beauty, magic, wonder, and awe lie hidden in plain sight. There’s gold in them thar hills (Mark Twain) — gold of the inward-investment kind! 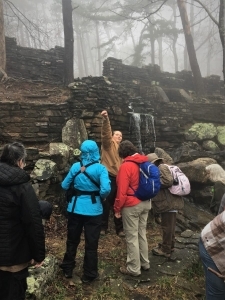 Last week’s post provided a broad conference and Cheaha overview: http://stevejonesgbh.com/2019/03/05/magic-and-wonder-on-the-mountain-an-inspiring-conference-at-cheaha-state-park/ (Magic and Wonder on the Mountain: An Inspiring Conference at Cheaha State Park). Friday morning I accompanied the interpretive hike group from the Lodge to the Rock Garden overlooking Lake Cheaha (lower left) and the sprawling Talladega National Forest beyond. 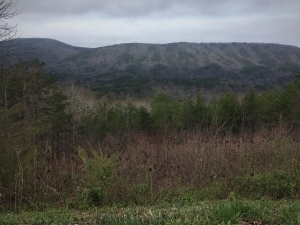 The view is to the WNW, encompassing thousands of acres of mostly National Forest. I stood among two dozen fellow environmental educators. We marveled at the landscape below us. Someone nearby, however, pointed out an apparent blemish, terming it an unfortunate scar upon the land. My iPhone camera shows the scar only faintly at about two-o’clock beyond the lake (photo left), a tawny opening in the forest. Enlarging the photo, with the resultant reduced resolution (lower right), reveals the scar as a 30-40 acre disturbance (my term for the moment). I will explain more fully as we proceed. The USDA Forest Service website expresses the Talladega National Forest’s rich history: “The National Forest Commission created the Oakmulgee Purchase Unit, located south of Centreville, January 21, 1935. The area was first settled in the early 1800’s. At that time, stands of timber were cleared for agricultural purposes and to build homes. What is now known as the Oakmulgee Ranger District was about 60 percent cut-over land. 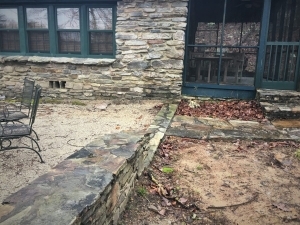 Had we been standing at Rock Garden 80-85 years ago, some 30-60 percent of the viewscape would have been “cut-over, cultivated, and abandoned farmland.” Much of the other 40-70 percent would have constituted previously cut-over or abandoned farmland, by then supporting second-growth forest. The only non-scarred and unblemished land would have been too steep to log or domesticate. In effect, the 1935 viewshed stood as a vast, nearly unbroken scar! 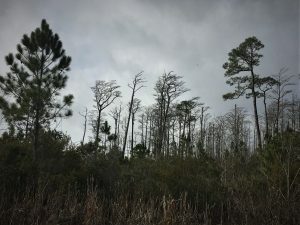 I found it a bit incongruous that some of my Alabama environmental educator colleagues were so quick to bemoan and lament the scar, as though it signaled some aberrant behavior by the Forest Service. And they missed the irony of demonizing National Forest management practices (timber harvesting to facilitate ecosystem diversity, wildlife habitat, and forest renewal) while enjoying the rich wood flooring, paneling, ceiling, and table in the upstairs boardroom (lower left) and the magnificent flooring and timber beams in the auditorium (below right). 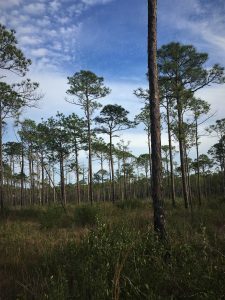 The created opening we spotted may have evidenced a pine bark beetle salvage sale, or a regeneration harvest to create early successional habitat for dependent wildlife, or provide additional edge for other species of birds or mammals. Forest management entails many such deliberate actions to achieve desired outcomes. Many designated outcomes require harvesting to affect stand density, species composition, forest structure, and successional stage. 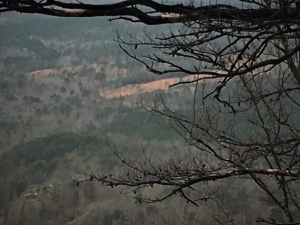 The view north from Bald Rock shows a rich mosaic of Talladega forest stands, including pine plantations, streamside management zones, and hardwood patch regeneration. I’m not sure whether those same colleagues would have found this view so offensive. My forestry practitioner inner-self viewed it as delightful. Our US National Forest System (193 million acres) operates “to provide the greatest good for the greatest amount of people in the long run” (first chief of the U.S. Forest Service and founder of the Yale Forest School, Gifford Pinchot). The Forest Service mission: “To sustain the health, diversity, and productivity of the Nation’s forests and grasslands to meet the needs of present and future generations.” Its motto is “Caring for the land and serving people.” From my own forestry undergraduate days I recall the fundamental role of the National Forests to produce wood, water, wildlife, recreation, and aesthetics. Professors emphasized the distinction between National Forests and formal Wilderness lands. The 1964 Wilderness Act defines wilderness: “A wilderness, in contrast with those areas where man and his own works dominate the landscape, is hereby recognized as an area where the earth and its community of life are untrammeled by man, where man himself is a visitor who does not remain.” That is in sharp contrast to the vast bulk of the Talladega National Forest (393,000 acres), exclusive of its 7,400 acre Cheaha Wilderness area. The view below is typical of the Forest Service’s management that cares for the land and serves the people. We foresters refer to it as multiple use management. Such management occasionally leaves scars and blemishes. I remind you that all who consider ourselves environmental educators are both teacher and student. We cannot teach the student until we first see and understand the land. We must understand that the scar can be a means… far more than a blemish or insult. That every mark on the landscape tells a tale that we must understand and interpret. Every scenic overlook provides a palette of teachable moments. Our role is to engage passion and avoid its potentially evil sister — emotion that obscures and taints understanding and interpretation. Please know that I am not casting shadows upon those who termed the management activity as a scar. Instead, I am taking advantage of what I saw as a teachable moment. I remain steadfastly impressed with the degree to which my fellow environmental educators demonstrated that they are well-informed, purpose-driven, passion-fueled, and resulted-oriented. Perhaps at next year’s annual meeting I’ll have an opportunity to expand on this theme addressing passion, emotion, and interpretation. The objective is to teach the student to see the land, to understand what he sees, and enjoy what he understands (Aldo Leopold). 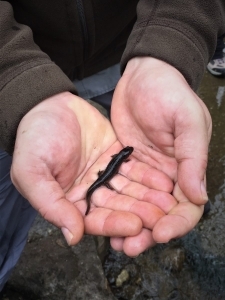 Environmental education should be passion-fueled, yet absent emotional bias. Motto: Encourage and seek a better tomorrow through Nature-inspired living. Imagine my surprise and delight to find the EE AA mission: Enhance the abilities of formal and informal educators to connect people to the natural world in order to foster responsible stewardship. I knew then that we would connect, and we did! We mission, share passion, purpose, and spirit. Whether college student or septuagenarian, the Earth stewardship thread connected us all. Rather than provide a detailed description of the conference (for that, please visit the EE AA website), I will offer a few photographs and reflections. I’ll begin with the conference theme: Magic and Wonder Atop the Mountain. 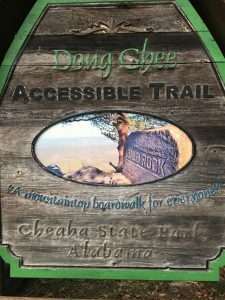 Visit my five previous GBH posts (from a two-day Cheaha visit mid-October 2018) to see my own observations on the magic and wonder of Cheaha State Park and the adjoining Talladega National Forest. 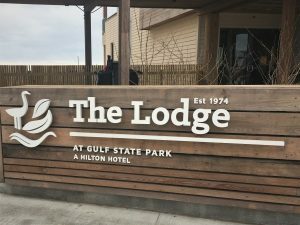 I arrived early enough Thursday afternoon (2/28) to check into cabin number five, stash my exhibit gear and books at the Bald Rock Lodge (conference headquarters), and walk the Bald Rock Trail, an ADA accessible boardwalk to the overlook. I suppose that because I grew up an outdoor enthusiast in the central Appalachians, I feel that the road leading up to Cheaha State Park is taking me home. As I walked the boardwalk, my heart pounded, but not from exertion. Instead, I experienced exhilaration with being back atop the mountain. I connected with all five portals: heart, mind, body, soul, and spirit. Each its own receptivity center. Each sending pleasant and lifting signals to my core. Feeling light, I floated along the trail. I admit (without reservation) to never having taken recreational drugs, preferring instead this natural elixir called Nature. Apropos, I’ve titled my third book (I’m selecting a publisher) Natural Elixir: Lifting Your Life through Nature’s Inspiration. 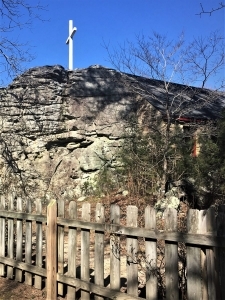 The forests atop Cheaha are not towering cathedral groves. Instead the harsh climate, thin soils, and shallow bedrock support mostly Virginia pine (ravaged 3-4 years ago by a severe ice storm) and chestnut oak, many weather-tortured and contorted (photos from the boardwalk). Yet I see magic and beauty even in these savaged trees, bearing testament to Nature’s extremes on a peak (2,407′) that mountain snobs would deem a foothill, if not just a molehill! But I urge visitors to look more appreciatively, marvel at the co-stars of this hill-top drama. Life finds purchase and offers adornment on every rock and tree-bark surface. 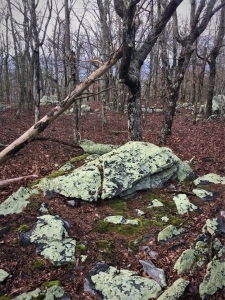 While a rolling stone gathers no moss, a stationary boulder atop Cheaha graciously harbors any and all lichen colonies. 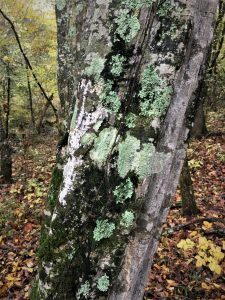 That morning’s rain brought deep color intensity and vibrancy to the abundant lichen. 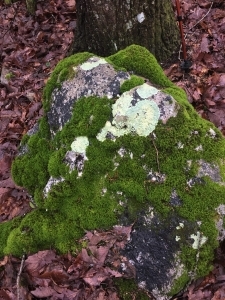 And moss likewise adorns every otherwise vacant surface at ground level, whether at the base of a tree or sharing a rock with its lichen companion. 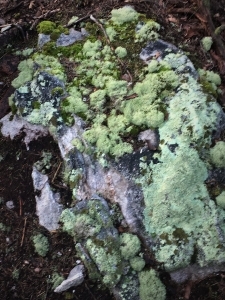 View the lower right photo as an alpine lichen lake surrounded by mountain slopes of moss forest. John Muir once wrote, “The power of the imagination makes us infinite.” I may not have felt infinite atop the mountain, yet I did feel the infinite beauty, magic, wonder, and awe of Nature. I sensed Nature’s infinite storm of beauty, also a term Muir employed 130 years ago. Heart still pounding with delight, I reached the Bald Rock overlook. The infinite storm of beauty still surged, the Talladega National Forest stretching to the north and northeast, lower left and right, respectively. The ebbing day saluted us with the last glimpse of blue sky we would see during the conference. A salute fit for kings! The dense-wedged stratus (lower left) reminded me of an Imperial Starship cruising from the south. Perhaps preparing to disembark a few alien environmental educators? 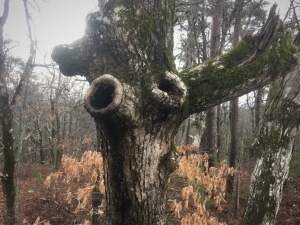 The interstellar educators did not register for the annual meeting, yet I did spot some forest oddities, suggesting that alien lifeforms may have been observing. I presented all of that to set the stage for the conference. Fact is, the conference theme did the same: Magic and Wonder Atop the Mountain. Not a person attending did not share the sentiments I expressed above in the Blog Post introduction. These are special people, blessed (they and I concur that theirs is a calling) and privileged to practice their craft and harness their passion in service to making tomorrow brighter through wisdom, knowledge, and hard work. Again, rather than revisit the printed program, rehash the array of speakers, or review the topics, here is a collection of photos that reflect the intense emotion, deep passion, and unbridled enthusiasm characterizing conference participants. 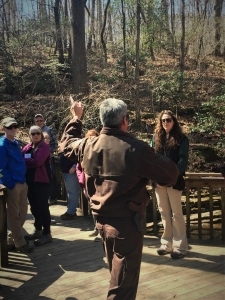 I like that both Renee Raney, Cheaha State Park Superintendent (lower left in the CCC-built lodge), and Mandy Pearson (lower right at the CCC-constructed reservoir), Cheaha Naturalist and EE AA President, are gesturing toward the heavens! Just part of the wonder and magic. Perhaps Mandy is acknowledging “Power to the Fog”! March 1st and 2nd, continuous fog enveloped the Park. 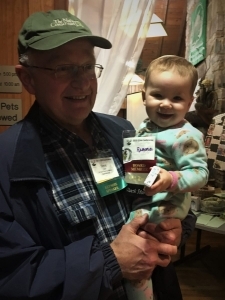 Ramona, 14-month-old daughter of two attendees, served as unofficial conference mascot. 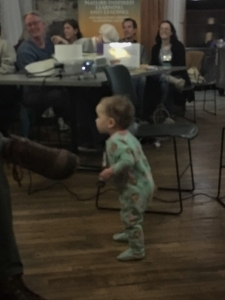 She helped entertain the audience during my Thursday evening address, forcing me to ad lib a time or two as she performed antics near the lectern. Ramona added levity and served as a not-so-subtle reminder that our focus is the future. That we are inspiring and enabling adoption of an Earth ethic to provide for seven generations hence… and beyond. 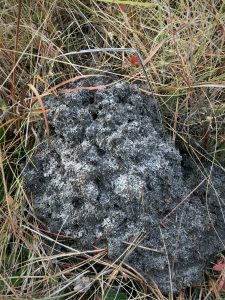 We found abundant evidence that animal life thrives atop the mountain. 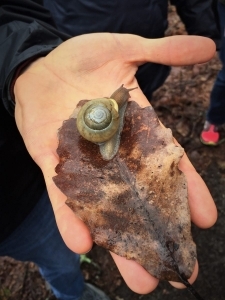 Our field trip groups found a salamander and snail, both organisms thrilled with February’s relenting rain and fog. 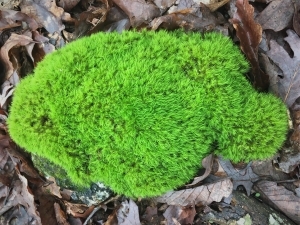 As the Conference theme expressed explicitly, we found wonder and awe atop the mountain wherever we looked, whether the view from The Rock Garden to Cheaha Lake and the Talladega National Forest beyond, or simply the exquisite moss fish (below right). I reminded fellow environmental educators time and again that every object, dead or alive, atop the mountain has a story to tell. Our task as educators is to accept such as fact… to believe that a story awaits discovery. 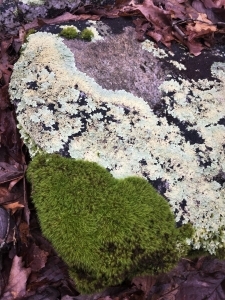 I view the lichen-painted boulder below and see an epic tail. The cast includes the rock and a Virginia pine. The rock cared little about, and likely never noticed, the tremendous ice storm that glistened the mountain a few winters back. The Virginia pine strained and groaned with the weight burden until physics prevailed, crossing a threshold that crashed the old soldier to the ground, and brought the twisted and crushed upper canopy to rest upon the rock, which paid little if any heed to the thundering impact. The rock and the mountain may know that the tree is but a fleeting occupant of the rock’s surface. 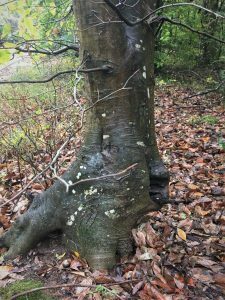 Time and billions of microbes will soon-enough reduce the wood to humus and then soil organic matter, which will in turn furnish nourishment and substrate to yet another tree. The cycle will continue until the rock finds itself sediment deposited in the Mobile River delta, and perhaps some day rising to top another mountain millions of years hence. Time means nothing to an atom, a rock, or a mountain. 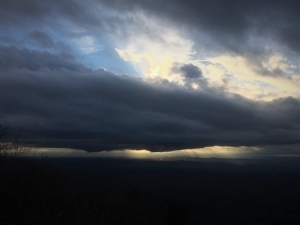 I witnessed great joy, inspiration, wonder, and magic atop Cheaha. I applaud the sense of enthusiasm, knowledge, and responsibility among the attendees. I congratulate their recognition and acceptance of the burden they bear for assuring a better tomorrow through wisdom, knowledge, and hard work. I am grateful that planners chose to invite me to give the welcoming keynote. I feel that I am an accepted member of the family. Our causes overlap. Our paths enjoy full harmony. In fact, yesterday I submitted my completed EE AA membership application form. That’s me standing by my Great Blue Heron banner (left) and EE AA Chair Mandy graced me with a photo hug (right)! As I wished them upon concluding my remarks: May Nature Inspire your life and vocation! Every day can be a journey of discovery and inspiration, a day of sowing seeds for a brighter tomorrow… a tomorrow that is in the hands of generations ahead. Every time I can inject a few lumens of Nature’s beauty, magic, wonder, and awe into a young mind (a young mind of any age! ), I have accomplished a victory. 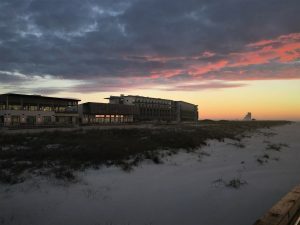 I described the first GSP Post as a broad “Overview of a Globally Significant Coastal Center for Sustainable Tourism and Earth Stewardship.” I issued my second GSP Post February 5, highlighting the beach, dune, savanna, and interior wetland ecotypes, offered “from my perspective as a doctoral level applied ecologist, lifelong Nature enthusiast, environmental educator, consummate champion for responsible Earth stewardship, and a tireless advocate for Nature-inspired life and living.” From that same perspective, I will reflected with photographs and text on my impressions and interpretation for a second set of ecosystems: evergreen forests and xeric forests. I included a section on the use of prescribed fire in Park vegetation management. Now, as a sky and cloud junkie, I’ll lead you on a tour of the firmament that arced above our heads during my visit to GSP. and the firmament shows the work of His hands. Although the photos that follow include some of the same foreground objects that commanded my attention and guided my text in the prior three posts, I am today treating those objects as foredrop, a term that I just created as antonym to backdrop. I will focus on the sky and clouds… the setting that in my view is often the natural feature that most excites my body, mind, heart, soul, and spirit. The foredrop for me is somewhat the invisible element that helps me focus on admiring and appreciating what lies beyond and above. Just as the snowy canvas backdrop sets the mood for the family Christmas studio photo taken in August, the pier, shoreline, and placid Gulf water below merely direct my eye to the incredible sunset we witnessed our first evening at GSP. The next morning — another treat! Lower left, dawn brightened the eastern sky under a stratus cloud deck rolling in from the west. Ten minutes later (lower right), the clouds had rolled a little further eastward as the sun reached from below my horizon line to paint the cloud undersides burnt orange. As I swung the lens shoreward, dawn-kissed stratus framed the Gulf State Park Lodge (with the nearest private hotel hazily silhouetted two-miles beyond). 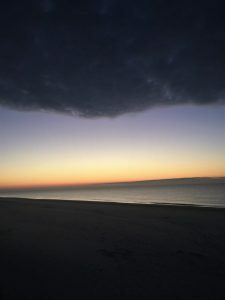 The image symbolizes the Park Enhancement as a new day dawning for a globally significant Coastal Legacy Project. 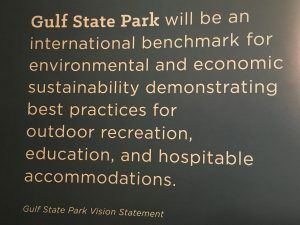 Perhaps the photo can serve as a visual representation of the Project vision: Gulf State Park will be an international benchmark for environmental and economic sustainability demonstrating best practices for outdoor recreation, education, and hospitable accommodations. 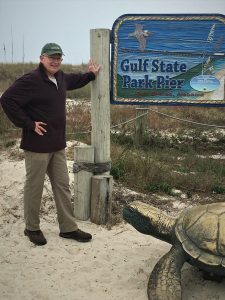 We began our all-day Park field tour under stratus clouds hugging the Gulf and its sandy beaches. We wondered whether our day would be fog-shrouded. 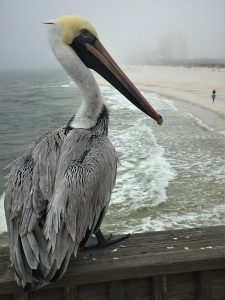 We also pondered how many times has Sam, the pier’s resident brown pelican, watched a new day dawning? 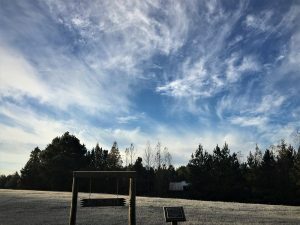 We headed into the Park as the sun began to eat through the stratus, breaking the solid, ground-hugging cover into patches of grey and weak blue. We lucked upon the perfect foredrop during this threshold transition from low blanket to high blue. 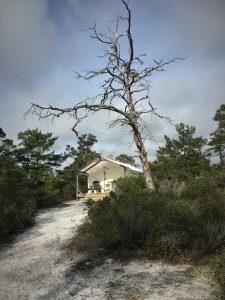 Of course, as with so many natural phenomenon, the sky likewise serves as perfect backdrop to the weathered sand pine standing atop the old dune! Nature so often gives us just what we seek… provided we, in fact, know what we seek and where to find it. 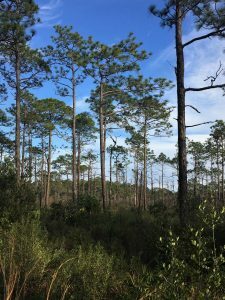 No hint of the morning’s fog and stratus remained as we explored a slash pine savanna. The next day’s cold front with accompanying low pressure, still several states to the west, hinted at its approach with cirrus five miles above us. What artist with brush in-hand has ever painted a more lovely sky or a more perfect foredrop?! Earth and sky; main canopy and understory; stem and crown; tree and sky — all intricately interconnected and inextricably integrated in beauty and function. Two sages spoke great wisdom about the web of life captured by my lens (photos above and below). Such beauty, magic, wonder, and awe. Keep in mind that I did not enter the Park to find these exquisite images. Instead, they found me and my eager eye. So often Nature rewards my wanderings. As I have written and spoken so many times, I am guided by five verbs as I venture into Nature. I am blessed with five grandchildren. Which one do I like best? Yes, none stands above the other. Yet among the two photos above (taken mid-afternoon well after the stratus had dissipated) and the one below (as the stratus was breaking), I can choose my favorite without harm or insult. 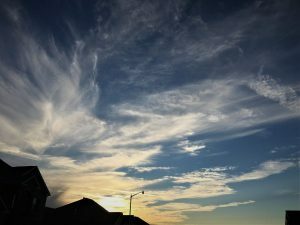 The impressionistic cirrus brush dabs (above right) earn my highest marks. However, as I work my way through the day’s sky and cloud portfolio, I am realizing that it is the combination of foredrop and backdrop, the total composition, and the ecological context, that in aggregate stir my senses. Nature and all other aspects of life and living, act in terms of the whole, which almost without exception, exceeds the sum of its parts. 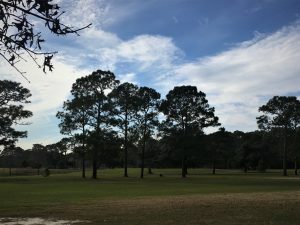 The two images below shift from a natural foredrop to the December-abandoned golf course. 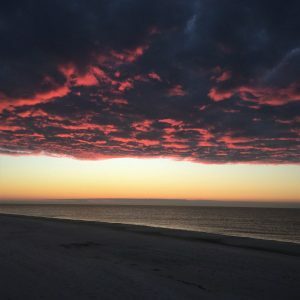 Just as we select from among seasonal backdrops for a family holiday portrait, choosing from among Gulf State Park foredrops alters the sky and cloud image and affect. Carrying my composite analogy a bit further, perhaps the most applicable aggregate is the entirety of images from my GSP tour. I suppose my own impression of Nature springs from my 67-year journey as a Nature-enthusiast and applied ecologist. Yes, it is the aggregate of a life in Nature that shapes my discernment of any single scene or moment in Nature. Isn’t that true for all elements and components and days in life and living? There comes often in life circumstances and occasions when we cannot, try as we might, distinguish between foredrop and backdrop. Between what might be essential and associated clutter. Between substance and distraction. Between what matters irritating noise. Between problem and nuisance. 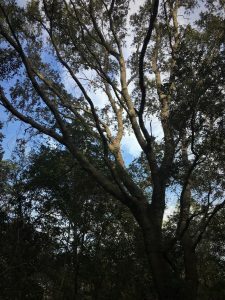 Is the photo below an image of a live oak with the sky beyond… or the sky seen through the oak’s spreading branches? Does it matter? I’ll end where we began. Sunset the first evening. Nature paints across time and place, just as we live across time and place. I urge you, wherever (and whenever) you are, to believe in its magic; look for its beauty; see its wonder; feel its inspiration; and act to embrace and steward this wonderful home we call Earth. May Nature enrich your life and living… Nature-inspired living! And may you pass it forward. Nature so often gives us just what we seek… provided we, in fact, know what we seek and where to find it. It is the aggregate of a life in Nature that shapes my discernment of any single scene or moment in Nature. So often Nature rewards my wanderings. http://stevejonesgbh.com/wp-content/uploads/2019/01/IMG_9192.jpg-01.18.19-Gulf-State-Park-Slash-and-Sky-in-Bog.jpg 1200 900 Steve Jones http://stevejonesgbh.com/wp-content/uploads/2017/01/gbhweblogo.png Steve Jones2019-02-20 15:31:032019-02-20 15:31:03Mid-January at Alabama's Gulf State Park: Oh Beautiful for Spacious Skies! 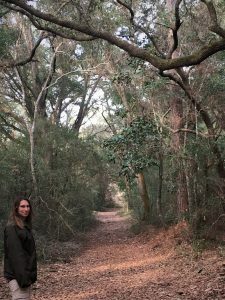 I described the first GSP Post as a broad “Overview of a Globally Significant Coastal Center for Sustainable Tourism and Earth Stewardship.” I issued my second GSP Post February 5, highlighting the beach, dune, savanna, and interior wetland ecotypes, offered “from my perspective as a doctoral level applied ecologist, lifelong Nature enthusiast, environmental educator, consummate champion for responsible Earth stewardship, and a tireless advocate for Nature-inspired life and living.” From that same perspective, I will now reflect with photographs and text on my impressions and interpretation for a second set of ecosystems: evergreen forests and xeric forests. I’ve included a section on the use of prescribed fire in Park vegetation management. I will rise from my grave with the hunger of wildcat, wings of kestrel, and with possession of my granddaughter’s granddaughter, to see what we have lost returned. My heart will be a cistern brimming with rainwater — drinkable rain. She will not know my name, though she bears the new forest about her, the forest so grand. She will have heard whooping cranes witnessing endless sky. While around her the forest I longed all my short life to see winks and slips and shimmers and thumps. Mutes and musks and lights. She will walk through it with the azure-bodied eagerness of damselfly. My child, I will try to call to her. My child. I have risen from the old cemetery buried in the forest where your people are laid. Where once a golf course began. That was houses and fields long, long ago. She will be yet a child and may not hear me. Perhaps I will not speak at all but follow her through a heraldry of longleaf, seeking for the course of a day the peace of pine warblers. And in the evening of that blessed day, I will lay to rest this implacable longing. 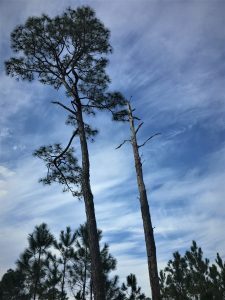 Auburn University’s Center for Longleaf Pine Ecosystems (CLPE) shares the dream of that future day. CLPE “conducts research to address knowledge gaps in the restoration, conservation and management of longleaf pine ecosystems which provide a variety of ecological, social and economic services for the people of Alabama and the Southeast.” The CLPE mission recognizes the tremendous services (ecological, social, and economic) provided by the longleaf ecosystem. And, I love the CLPE’s action orientation: to enable us and future generations to better restore, conserve, and manage these forests. Keep in mind that “conserve” connotes wise use and management. 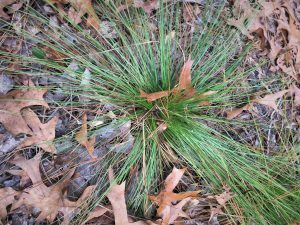 Why do we refer to longleaf pine’s first few years as the “grass” stage? The lower left photo answers the question. “Seedlings are stemless after one growing season and this “grass-stage” lasts from 2 to many years. It may last as long as 20 years if brown-spot needle blight or competition is severe. During the grass-stage, the seedling develops an extensive root system, and the root collar increases in diameter. When the root collar diameter approaches 1 inch in diameter, height growth begins. An open-grown seedling grows 10 feet (3 m) in 3 years once height growth is initiated. Branch production is delayed until the seedling reaches 10 to 16 feet in height. If grass-stage seedlings are top-killed, they can sprout from the root collar” (USDA Forest Service). The ability to sprout from the root collar enables the seedling to survive a grass stage fire. Beyond the grass stage, its rapid initial height growth (lower right)permits it to reach above the mortality zone for lighter ground fires. How can you beat the shaggy dog look during the initial height growth years!? I also like the often uneven-aged composition of natural and managed longleaf stands. The foreground sapling (lower left) stands back-dropped by a mature longleaf. One generation looking over the next. How many fires have passed through the stand since the older tree sprung from the grass stage? 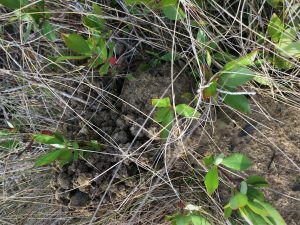 Without fire, the understory would have converted to other vegetation long before the sapling germinated, survived the grass stage, and began its height growth. Lower right shows another example of uneven-aged longleaf. 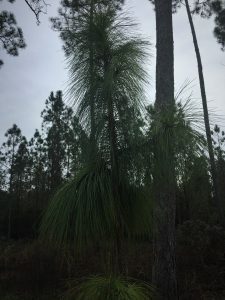 The sapling stands at the base of a much larger and older individual; many mid-size longleaf occupy the immediate background. Every stand tells its own story of establishment and development. Such a stand offers rich diversity in crown height and canopy density, as well as ground-level sunlight and shade patterns. 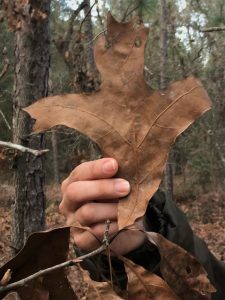 To upland birds, an uneven-aged longleaf forest offers a hearty welcome: Come one; Come all — There’s something for everybody! 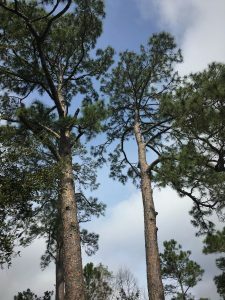 Slash pine (Pinus elliotti) throughout its range develops in even-aged stands. 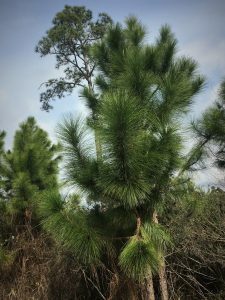 Its seedlings and saplings are far less tolerant of fire than longleaf. The open savanna (lower left) typifies a mature slash pine forest. The relatively flat canopies suggest that these pines have reached terminal height. Same for the individuals lower right — flat-crowns with coarse branching indicates maturity. 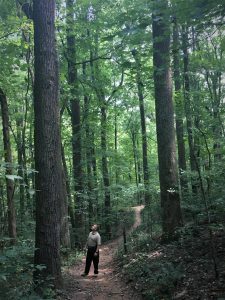 Visualize botanist William Bartram traveling across the south on horseback through such forests more than 200 years ago. 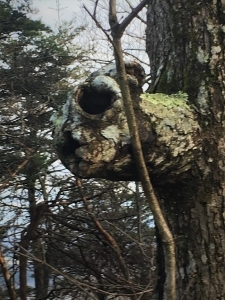 GSP’s evergreen forests do attract avian diversity, including the bald eagles who were tending young at this nest. 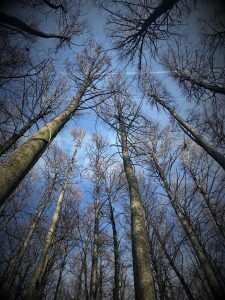 One of these days I hope to acquire a real camera (graduating from my iPhone) with a lens capable of capturing more than a mass of branches assembled high above in a tree fork. Please apply your imagination and see the eagle with its white head emerging from the nest. We also saw another occupied eagle nest on the Park. What a great story nationwide of bringing this magnificent avian pinnacle-of-the-food chain back from the abyss to abundance. The message is clear — if we awaken with head, heart, and intent to save a specific charismatic mega-fauna, surely we can respond to save Homo sapiens from degrading our one Earth beyond a threshold of restoration, conservation, and management. 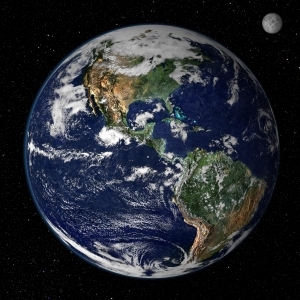 The year of my birth, our global population stood at 2.5 billion; we are now at 7.7 billion. The eagle recovery offers hope and promise for our future as Earth citizens… but only if we awaken to our self-induced peril. Only we can save us from ourselves; the burden is ours alone. 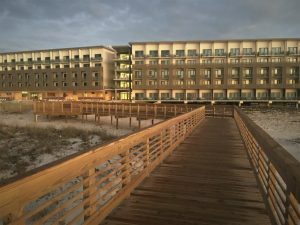 Gulf State Park’s Enhancement Project offers a fresh and essential way to demonstrate best practices for outdoor recreation, education, and hospitable accommodations… an international benchmark for environmental and economic sustainability. 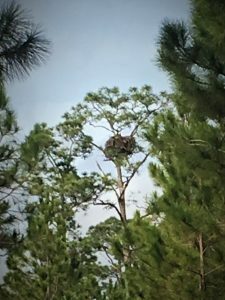 Two active eagle nests evidence success… success that can be extended in philosophy, principle, and practice globally. Restore, conserve, and manage we must. As Yoda, the Jedi Master and ultimate sage and life coach, observed, “Try not. Do. Or do not. There is no try.” We must not try to save Earth from our own devices; we must restore, conserve, and manage ourselves and our planet sustainably. Lessons from the Park Enhancement Project begin the journey of saving us from ourselves. Employing tools like prescribed fire is one step in the journey… a journey that occurs one ecosystem at a time and culminates in our global ecosystem here on island Earth. Since the first time a lightning bolt seared tinder grassland or forest, ecosystems have evolved with the ravages and benefits of periodic fire. We employ prescribed (also termed controlled) fire to yield the benefits and avoid the ravages. To burn under our terms to achieve results of our choosing. Consider prescribed fire a tool that we apply judiciously, mimicking nature’s way to reach a desired future condition. 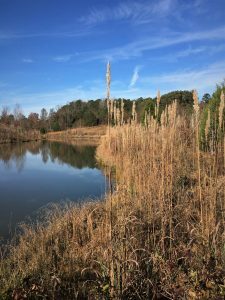 Nature’s seeks to convert GSP wetlands and meadows to forest, a “climax” ecotype that will persist until catastrophic wind or wildfire begins the cycle anew. Were the Park a “preservation,” standing back over the long course of time might be an appropriate option. One summer during my Alaska days, fire consumed six million acres of boreal forest and taiga, with little attempt at suppression and control beyond protecting villages and scattered cabins. Mostly federally-owned wildland, fire amounted to a natural occurrence allowed to run its course awaiting rain or the eventual snowfall. The same no-suppression practice prevailed a few years ago as wildfires raced across vast expanse of remote Yellowstone National Park. We cannot afford the luxury of “preservation” at GSP. We must focus aggressive on restore, conserve, and manage to meet desired outcomes. Lower left shows a meadow intent upon converting to slash pine forest. 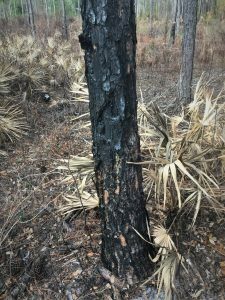 Managers control burned the tree-colonizing meadow in November 2018, the 28th day of the month… just before the seasonal burn window was about to close. Crews wanted a burn intense enough to kill the encroaching pine. The two individual saplings may have escaped mortality (they retain tufts of green foliage at their tops); most of the seedling pines are dead. Again, slash generally does not handle fire well at the seedling stage. Managers can eliminate the few surviving trees if they wish. The fire at lower right sought a different result. Managers (that same November day) ran a less intense fire through this established sapling and pole slash pine stand to retard the thick brush and understory hardwood trees that were encroaching, competing effectively with the pine, and that would eventually convert this site (via natural succession) to other than evergreen forest. The Park land management plan designates a desired pattern of ecotypes. Fire helps achieve the targeted pattern. 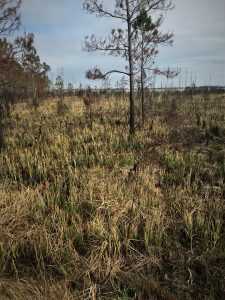 Lower left is another wet meadow burned to deny the invading slash pine army a permanent foothold –seeing the standing dead small saplings. 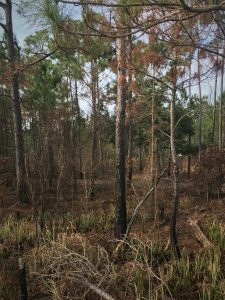 Lower right demonstrates that once slash pine reaches that critical diameter of 3-4″ it can tolerate a fairly hot ground fire. This individual had a a little lower crown scorch and will thrive this coming growing season. 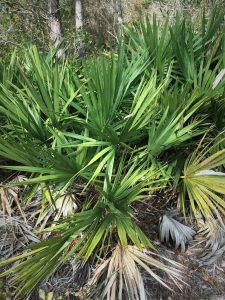 Yet the fire burned or killed the visible above ground vegetation nearby, include the saw palmetto (Serenoa repens). 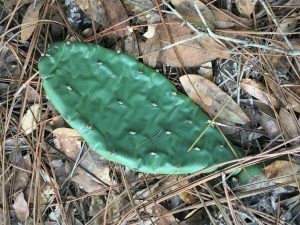 Here’s an unburned saw palmetto on the Park. The Gulf of Mexico coastline has shifted over the long course of time. The Eastern Gulf Coastal Plain physiographic province covers nearly two-thirds of the state. The Lower Coastal Plain constitutes roughly the southernmost one-third of the state. As ocean levels have ebbed and flowed across the past few million years, the beach line from time to time extended inland to the Upper Coastal Plain. We should not be surprised that the entirety of GSP comprises multiple dune lines… upland areas of deep sandy soil. These dry (xeric) and infertile sites support forest types quite distinct from the evergreen forests. 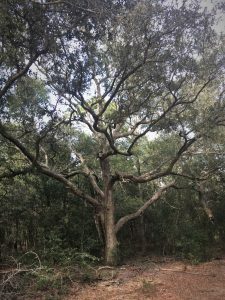 Sand live oak (), turkey oak (), and longleaf pine are the major overstory species. Tree heights seldom exceed 30-50 feet. Stocking (the number of stems per acre) is low, as is the biomass per acre. Dense overstory and deep shade are uncommon. The understory is relatively open, contrasted to the more common jungle-like subordinate vegetation in the evergreen forests. The lower left photo shows typical stocking, crown density, species composition, and understory condition. Lower right shows an old access road leading north along the now-abandoned Park golf course to a former cattle-dipping station. 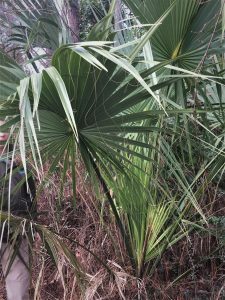 We found a few very impressive sabal palmetto (Sabal palmetto) on these old dune ridges. Attractive fanning foliage. 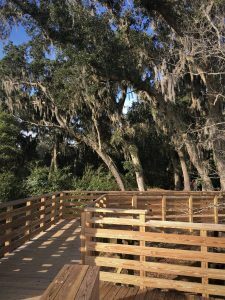 Did I mention that both sand and southern live oak are “nearly evergreen,” dropping its leaves and sprouting new foliage within several weeks in the spring. 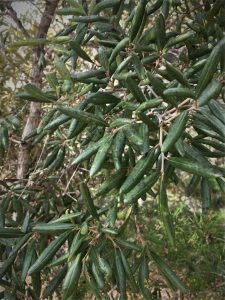 Here are sand live oak leaves, during my mid-January visit, still looking quite summer-like. Turkey oak (Quercus laevis) tolerates the most xeric of the old dune ridges. Its corky bark (lower left) protects established individual stems from periodic fires. 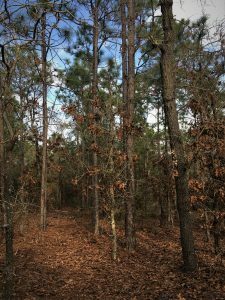 Few other hardwood trees can survive the dry, sandy soils of the old dunes. Longleaf pine often shard these inhospitable sites. Easy to see how this oak earned its moniker — its leaves (lower right) resemble a turkey’s foot. 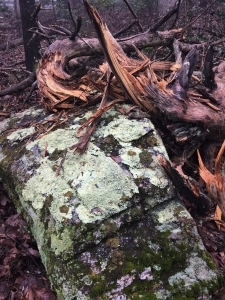 Lichen has colonized this turkey oak trunk. Recall that nature abhors a vacuum. 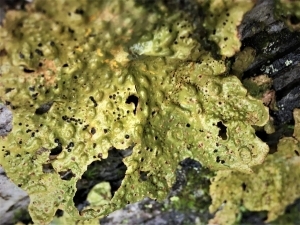 Lichens find purchase at ground level on these exeric sites. This species is deer moss (Cladonia evanesii), apparent in both small clumps and as a nearly full ground cover. 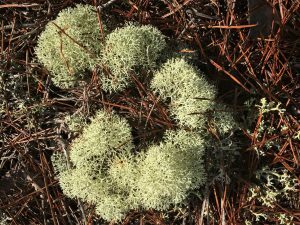 Dixie moss lichen (Cladonia subtenuis) is common yet less prolific at Gulf State Park. 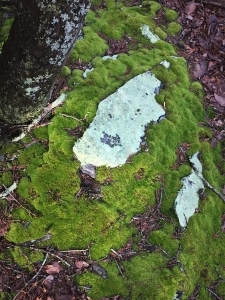 Note its greenish hue contrasted to the near white of deer lichen. 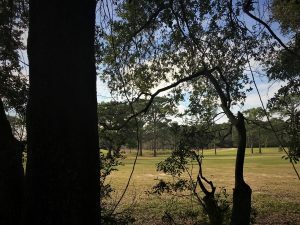 Park personnel are contemplating a significant habitat shift for the Park’s golf course, which abandoned golf operations in December 2018. Within the Park’s coastal legacy Enhancement planning, what is the highest and best use for the former golf course? Looks pretty good just sitting there with that luscious sky — that beautiful firmament showcasing above it! Perhaps managers will simply allow nature to implement her own plans… doing what come natural to her. Isn’t the golf course yet another vacuum? Another opportunity to creatively fill a void? I’ll look forward to seeing the plans unfold… whether Park staff designed or nature-designed. Fire and forests seem strange bedfellows, yet some forests are absolutely fire-dependent; understanding Nature requires that we comprehend relationships. Everything in Nature and life functions according to resource availability and limitations. Nature’s beauty, magic, wonder, and awe pay little mind to site constraints and limitations — a majestic evergreen forest possesses no more nobility than a xeric scrub oak forest. May Nature Inspire and Reward you! 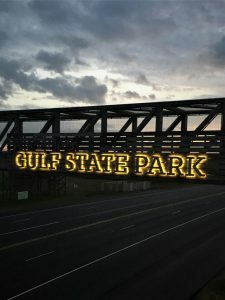 The name Gulf State Park speaks volumes. 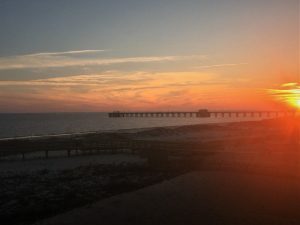 Two-and-one-half miles of white sand beaches define the Park, the coastal gem in Alabama’s 22-pearl, State Park necklace that reaches to the Tennessee River Valley, nearly 400 miles to the north. 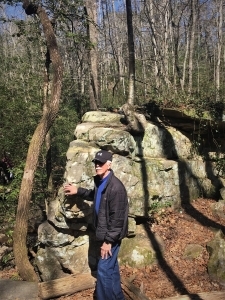 Advancing at a rate of a week per 100 miles latitude and a week per 800-feet vertical, spring will reach Monte Sano State Park’s plateau-top six weeks after its arrival on the Gulf coast. Because we were at GSP when many of my northern friends (located in PA, NY, NH, etc.) 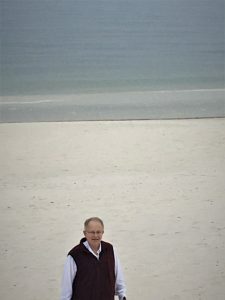 were facing a major winter storm, I asked to have this photo taken so I could (and I did) send them a taunting image of me on our “snowy” south Alabama beaches! 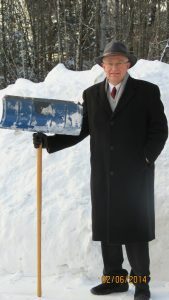 I told them that I had no trouble driving, or difficulty shoveling, and didn’t get a bit cold. The dune ecosystem begins immediately interior to the flat sandy beach. The endangered Alabama beach mouse flourishes in this zone. GSP provides the most expansive protected dune system within the mouse’s range. 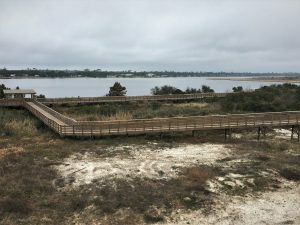 The Park is working tirelessly to expand and stabilize the dunes. 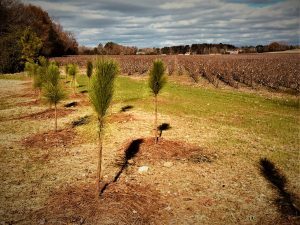 One fascinating step in that endeavor involves securing the season’s Christmas trees in small piles, allow nature to work her magic by depositing wind-blown sand around the piles and building new dunes in-situ. Further interior, fully vegetated stabilized dunes transition to dune ridges and upland sand scrub ecotypes. I took this photo from the boardwalk trail on the south side of Lake Shelby. This is a zone of intermingled marsh grasses and forbs, standing water, and thick shrubs on the elevated dunes. I won’t venture a guess at species composition; I know my limits. I do know the Park is intent at maintaining these diverse ecosystems. Taken from the pedestrian bridge crossing the coastal highway, this view (below left) looks north across Middle Lake to the campground and Nature Center. 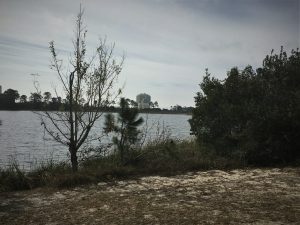 Nearly a mile inland, the Little Lake shoreline (below right) offers a view of the Orange Beach beachfront hotel high rises more two miles to the southeast. Once again, wildness lies within sight of fully developed coastline. The contrast is sharp; the message is stark. Except for the paved trails, a few non-native species, and the distant commercial skyline, the Park ecosystems are timeless and ageless. 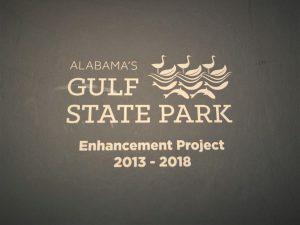 From the 2016 GSP Master Plan: Gulf State Park is a one-of-a-kind environmental treasure, with a rich diversity of ecosystems and 6,150 acre area. 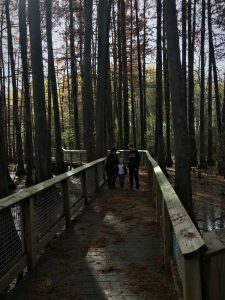 Restoring the environment and promoting stewardship are key elements of the Master Plan, creating a place where everyone can connect with nature. Outside the Park, wildness lies remote… somewhere else in time and place. Park visitors certainly connect with Nature. I suppose that tourists who play at the beach, bask in the sunshine, enjoy food and drink, hit the putt-putt courses, and troll the arcades are, in some fashion, connecting with nature. As for me, I would view such a vacation as a sentence. I would shrivel… mentally, physically, and emotionally. I would expire in body, mind, heart, soul, and spirit. Instead, within Gulf State Park, I soared with its beauty, magic, wonder, and awe. In my younger days as an environmental effete, I would have scoffed at the thought of thousands of snow-birders on the trails. Those days are done; now I revel at the sight of so many people understanding and appreciating wildness. I take solace that the message of Earth stewardship perhaps is finding traction. Again, I am convinced that GSP stands as a globally significant coastal legacy project. Please recognize that the nine identified ecosystems do not stand clearly delineated and distinct. The margins often blend and intergrade… across both space and time. 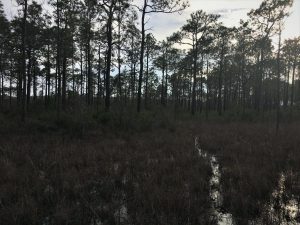 The wet grass and shrub zone below may have once been a marsh, now filling in and “dry” enough that slash pine (Pinus elliotti) insists upon invading. Note the 4-10 feet tall pine extending from the ridge well over a hundred feet into the meadow. 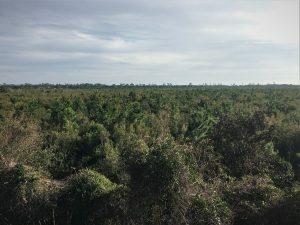 Once the pine are established, their powerful vertical pumps and effective evapotranspiration will further dry the site, in effect sealing the transition from marsh to pine forest. Park managers had hoped to run a prescribed fire across the site the prior November. The weather did not cooperate for running a fire hot enough to ignite or kill the sapling pine. They plan to try again this coming fall. 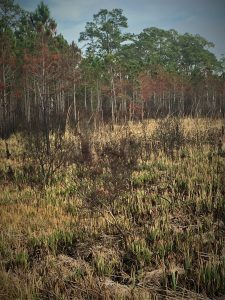 A fire will not eliminate or discourage the desirable wetland species, which are accustomed to periodic “catastrophic” burns. Sure, it will kill the above ground vegetation, but it will re-sprout or seed-in-place will germinate in the exposed soil rich with nutrients released by the fire. Conservation entails wise use and management. Management requires the deliberate application of art (many decisions involve subjective values) and science. The Park is not a preserve, where Nature is permitted to run her course. Slash pine occupies the upland foreground (below). I snapped this photo to capture the cypress (Taxodium distichum) swamp beyond. The cypress are mature as evidenced by their flattening canopy; that is, they have achieved their terminal height. These two ecosystem types occupy distinct sites — a freshwater swamp and an upland ridge. As we approached this photo point we watched 10-15 cormorants leave their cypress perches. Perhaps some day I will buy a camera with telephoto lens capable of catching images my iPhone can only dream to capture. Imagine the view below if instead of savanna, this forest were closed. We would see a solid wall of forest, devoid of the incredible sky now drawing our eye and accenting the scattered slash pine. Since my early career days with Union Camp Corporation, I have loved the flatwoods aesthetic. 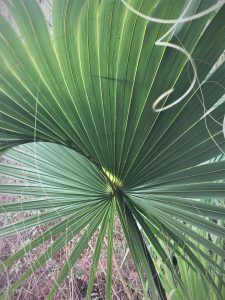 However, they can be impenetrable by foot… briars, jungle-like shrub layer, brutal saw palmetto, snakes, biting insects, choking vines, and stifling heat. Like I said, I love the aesthetic… from the trail! The Park excels at identifying and interpreting the ecosystems. Vegetation differences correspond to associated fauna — birds, reptiles, amphibians, and mammals have niche requirements. 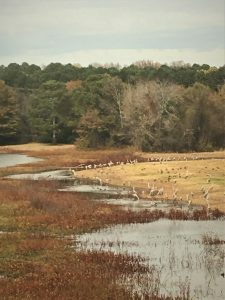 A devoted naturalist could commit years to learning the intricate intertwined ecological nuances and relationships on GSP’s 6,150 acres and nine distinct ecosystems. 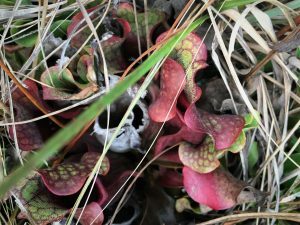 The Park’s pitcher plant bog requires requires third-mile hike off of the 28-mile bike path system, through first a ridge forest, then into a savanna, growing increasingly more poorly drained to the bog itself. Standing water 4-10″ deep challenged my boot waterproofing (below). We tread carefully to avoid stepping on pitcher plants. 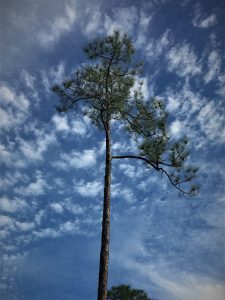 Again, the sky is visible through the widely-scattered savanna slash pine canopy. We found three species of pitcher plant. White-top (Sarracenia leucophylla) and purple (Sarracenia purpurea) pitcher plants (below left and right, respectively) were very evident and abundant. 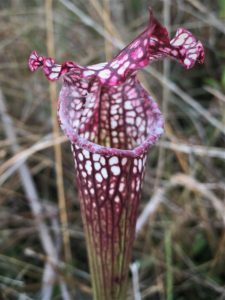 The pitchers are modified leaves (trap leaves), which the Alabama Plant Atlas says, “are erect, hollow, tubular in shape with an arching hood over the opening. The trap leaves are green towards the base and white with red veins near the opening. They are pubescent with downward pointing hairs. The hollow interior of the leaf in partially filled with rain water and digestive enzymes. Insects attracted to the colorful leaves drown in the fluid and are digested by the plant. Flowers are solitary on a long scape. The flowers are nodding and red in color.” Last year’s flower stocks and brittle flowers still waved above the basal trap leaves. In contrast to the erect white-top trap leaves, the purple pitchers hug the ground. Kelly, my tour host and Park Naturalist, identified a diminutive third species (I believe she referred to it as a parrot pitcher plant). However, this old guy was unable (unwilling) to go to my knees in the standing water to actually see and photograph the few specimens she spotted. I stood with weak eyes and still-dry knees, humbled that I failed this challenge. Had I remembered to bring my selfie stick, so that I could reach the plant without kneeling, I would have captured all three. The burrowing crawdad or crawdad (Fallicambarus sp.) is another bog denizen. The genus includes 19 species; I was unable to identify species. 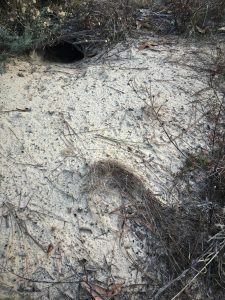 The photographs below show the chimneys, composed of piled sand and mud pellets to create a vertical corridor for the crustacean to exit or enter its water-filled chamber 2-6 feet beneath the surface. I have seen these mud chimneys in many places where we have resided, yet never have I seen the actual critter. 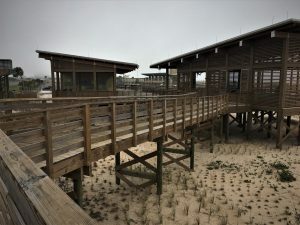 Water is a dominant ecosystem component within Gulf State Park… from the Gulf to some 800 acres of fresh and brackish ponds and marshes, savannas, and bog sites where water lies at or near the surface for much of the year. Nearby Foley, AL averages 66 inches of annual rainfall, which is 11 inches less than where I live in northern Alabama. Growing seasons are long; these water-based ecosystems in this near-tropical climate are home to dynamic and diverse plant and animal communities. We saw only a sampling of the richness that varies between and within ecosystems… and across the seasons. We scratched the surface. The Park is striving to tell the entire story of life and living within this globally significant coastal legacy site. I am grateful for the opportunity to spend a day with a naturalist who knows the Park and its life. I learned a great deal, including gaining a deeper appreciation for how much I do not know. I will shift gears in my third of four GSP Posts to the upland ecosystem elements. 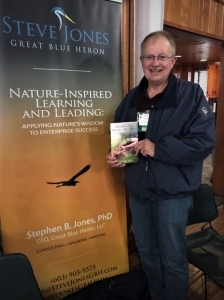 I wrote my books (Nature Based Leadership (2016) and Nature-Inspired Learning and Leading (2017)) and the two scheduled for 2019 (Weaned Seals and Snowy Summits: Stories of Passion for Place and Everyday Nature and Harnessing Nature’s Wisdom and Inspiration) to encourage all citizens to recognize and appreciate that every lesson for living, learning, serving, and leading is either written indelibly in or is powerfully inspired by Nature. Both published books are available on Amazon and other online sources. Restoring the environment and promoting stewardship are key elements of the Park Master Plan, creating a place where everyone can connect with nature — an essential goal for global life and living. Nature offers gifts from the past; we must protect and manage to pass our natural treasures forward without diminution. Take advantage of every opportunity (Learning Everywhere) in Nature to sow seeds for making tomorrow brighter. Living harmoniously within Nature is essential… and it is doable with wisdom, knowledge, and hard work. We must adopt a land ethic as a societal cornerstone in all that we do; conserving wildness is not necessarily self-defeating. May Nature Inspire and Reward you… and keep your mind young! One hundred forty million dollars later, the Vision is now reality. We arrived early enough Wednesday to enjoy a near-lodge late afternoon stroll. Thursday’s meeting (which brought me to Gulf State Park) allowed more time for both morning and afternoon strolls. 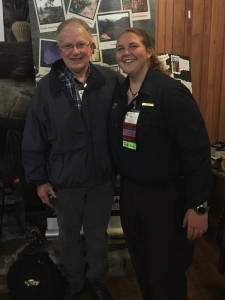 Friday I spent nearly nine hours on-site with Kelly Reetz, the Park’s Naturalist… a “globally significant” naturalist and environmental educator in her own right! The academic in me yearns to tell the Enhancement Project story… the entire story. I promise to resist. The Project Book does just that. And does it thoroughly and beautifully. 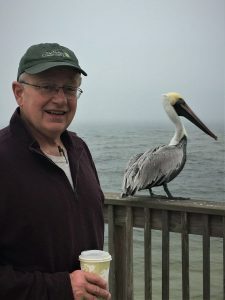 No need for me to do more than offer a broad overview from my perspective as a doctoral level applied ecologist, lifelong Nature enthusiast, environmental educator, consummate champion for responsible Earth stewardship, and a tireless advocate for Nature-inspired life and living. 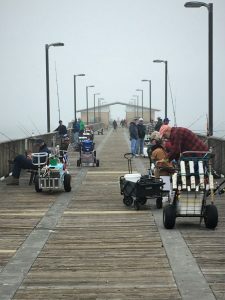 The Park’s 1,500′ pier provides access beyond the shore and sand bars. Nothing beats the off-shore perspective on the Park’s 2.5 miles of beach and dunes. 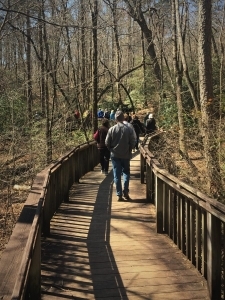 Miles of boardwalk offer easy pedestrian and bicycle access to the Park’s nearly ten square miles. 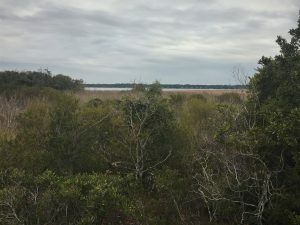 This view, from Pedestrian Bridge East crossing the east-west highway connecting Gulf Shores to Orange Beach, is to the north looking across Middle Lake to the campground (496 sites) and Nature Center. 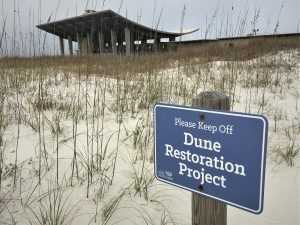 Dune Restoration is a principal Enhancement Project Goal: “Create a dune system that encourages a connection to nature and maximizes the ability for that system to provide protection, habitat, and resiliency for all types of communities.” That’s the Beach Pavilion beyond the sign — a shelter for escape from sun and inclement weather and for education. Recall one of the Enhancement Project’s primary goals: Learning Everywhere. The Interpretive Center is a core element… and one of many “everywheres” throughout the Park! 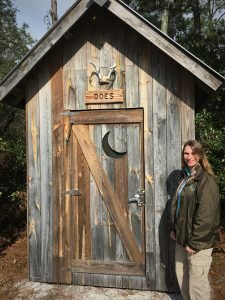 Designers engineered a lighter element at the Outpost, a three-platform remote camping area with these Does and Bucks outhouses! 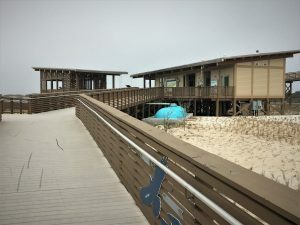 The nearby city of Orange Beach designed and built the Outpost in cooperation with the Park — what a great symbol of shared mission and joint venture! It’s the way natural communities operate within vibrant ecosystems. Here’s one of the three platforms… outfitted with chairs on a front porch and hammocks within. I had little idea how emblematic of the Park this scene is until I viewed the photo several days later. The low stratus began to break, permitting the sun to illuminate the white of sand, platform tent, and clouds to intermingle. Contrasting the life and vitality on this inland dune ridge, the sand pine skeleton symbolizes that both life and death compose the ebbs and flows of these coastal ecosystems. Or, for that matter, any ecosystem on our fine Earth. My mind relaxes when the photo draws me into its intimate setting, emphasizing that this one spot is a microcosm of the entire Park. A special place where life abounds in multiple textures, and senescence and rebirth integrate seamlessly and in perfect long-term balance. The Enhancement Project assures that across the Park human use and Nature are in perfect long-term balance. 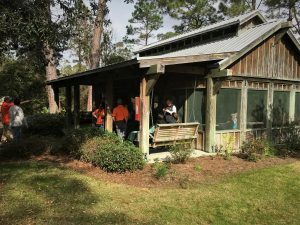 The Forest Pavilion and Butterfly Garden, an interior Park learning facility, sits over a mile from the nearest road and parking area. Accessible to only bicyclers and pedestrians, the classroom had a full house of snow-birders enjoying a presentation on Park reptiles. Again, Learning Everywhere! Here is one of several Pause Stations located throughout the Park and its trail system. 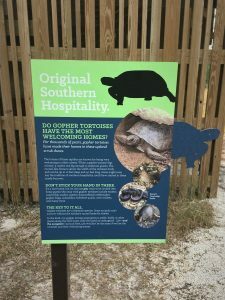 This two-story structure allows visitors to explore a representation of a gopher tortoise burrow. 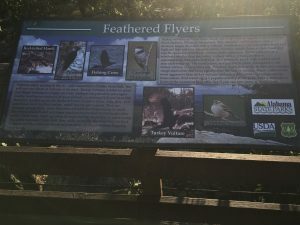 Interpretive signs tell the tale while riders and hikers take a break to catch their breath. Aldo Leopold lamented 70 years ago in A Sand County Almanac: “Is education possibly a process of trading awareness for things of lesser worth?” Dr. Leopold would have enjoyed seeing the visionary outcome of the Enhancement Project. Learning Everywhere! Nearing completion, the new Learning Campus will house, feed, and immerse up to 64 participants in a state-of-the-art self-contained facility, within a natural setting for hands-on learning. 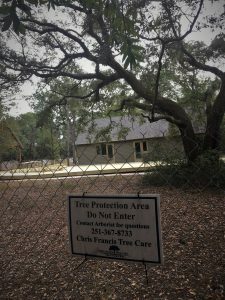 Fencing protects this live oak from construction equipment damage. Other natural vegetation throughout the emerging campus is similarly protected. I hope to return to offer a lecture or lead a future workshop. I include this photo to evidence yet another option for overnight accommodations and to provide some notion of the Park’s scale. The cottages and cabins sit on the north shore of Lake Shelby. The Park’s water tower stands approximately one mile to the southeast. 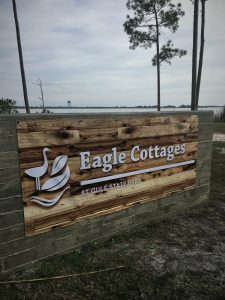 A cottage resident can walk or bicycle (on paved or boardwalk trails) from this viewpoint to the water tower, beach, lodge, forest pavilion, or any of the other features I’ve mentioned. 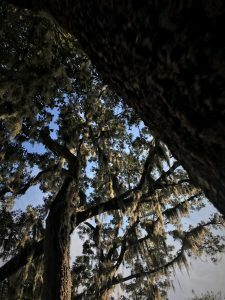 What better location to place a resting area and overlook than among live oaks draped in Spanish moss, a quintessential symbol of the deep south! All conservation of wildness is self-defeating, for to cherish we must see and fondle, and when enough have seen and fondled, there is no wilderness left to cherish. I believe the Enhancement Project faithfully ensures against excessive seeing and fondling. Although not true wilderness, the Park certainly constitutes nearly ten square miles of wildness, within a long strand of continuous development where seeing and fondling leave little wildness left to cherish. My favorite quote: The land ethic simply enlarges the boundaries of the community to include soils, waters, plants, and animals, or collectively: the land… In short, a land ethic changes the role of Homo sapiens from conqueror of the land-community to plain member and citizen of it. It implies respect for his fellow-members, and also respect for the community as such. May Nature enrich your life and living… Nature-inspired living! And may you pass it forward. Remember: Learning Everywhere, Everyday! 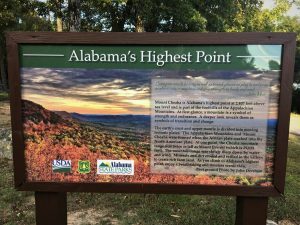 Okay, time for the fifth of these Cheaha-themed Great Blue Heron Blog Posts from my mid-October visit to Alabama’s highest point. I believe fundamentally that every lesson for living, learning, serving, and leading is either written indelibly in Nature or is powerfully inspired by Nature. 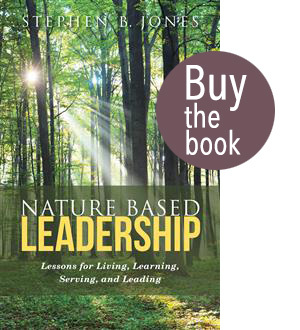 I incorporated that conclusion and its life-guiding forces throughout my first two books: Nature Based Leadership and Nature-Inspired Learning and Leading. I carry the theme forward in Weaned Seals and Snowy Summits: Stories of Passion for Place and Everyday Nature, which should see published daylight by mid-2019. Perhaps about the same time, my Harnessing Nature’s Wisdom and Power for Life and Living will be available. Meantime, I will offer Nature’s lessons piecemeal through these Blog Posts. The message I offer today is that knowledge, wisdom, and appreciation fuel my own passion for Earth stewardship and aid in seeing and interpreting Nature’s guidance for life and living. 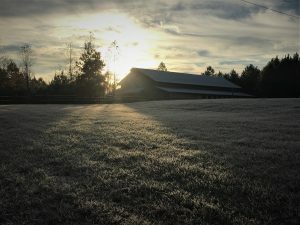 I am able to read and translate Nature’s language on the bases of: a lifelong love affair and intimate relationship with wildness; bachelors and doctoral level education, respectively, in forestry and applied ecology; and nearly four decades of applied research and practice in natural resources study and management. I bring my science knowledge and emotional embrace of Nature to bear in writing about Nature’s principles, tenets, and lessons. 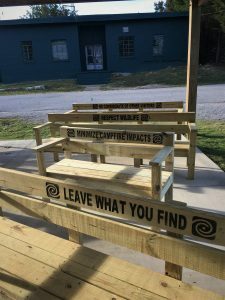 Cheaha State Park does its part in helping Park visitors understand, appreciate, and accept their obligation to Earth stewardship via some of the most exquisite interpretative signage I have encountered anywhere in Nature. 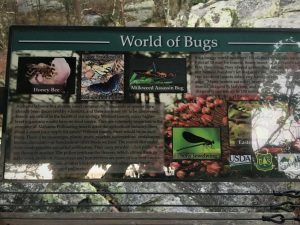 So view this Post as a quick tour of Cheaha through a portfolio of the Park’s signage. Unlike nearly every other Blog Post, most of the formal images below (the 13 with the green banner and message fully contained in the image) are official State Park master images. The photo below is mine taken on-site of one of the official signs mounted and in-place. Likewise, this is my photo of the wood-routered Bald Rock ADA-Accessible Trail entrance. And this the first of the official sign images. What better place to begin than with reference to the human occupants who lived within this mountain terrain for 15 millennia prior to European settlement? Mount Cheaha does not stand isolated and separate from the forests, peaks, and valleys surrounding it. The ecosystem extends across and beyond the Talladega National Forest. The story of Cheaha shifts to the tale of European settlement; the official image and my photo of the sign on-site. 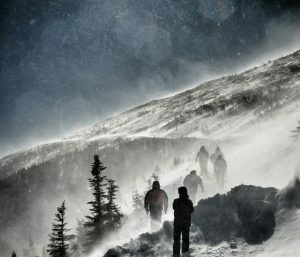 Humans account for only a small cross-section of life in these mountains. Forest harvesting and wood products manufacturing have played huge roles in the cultural and economic vitality of these hills and valleys for the past 200 years. I’m impressed by a thread of history common to all the Alabama State Parks I’ve visited. 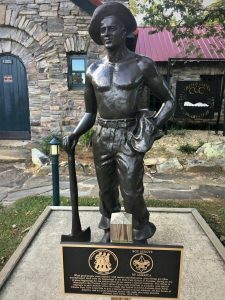 The Park chronicles and celebrates the significant role the 1930s Civilian Conservation Corps played in establishing Cheaha State Park infrastructure. The CCC built to last (and that’s not just a slogan or tag line… and so much of the stonework stands in its original splendor some 80 years later. The same thread weaved through the story of Maryland’s State Parks and State Forests, where I worked all three of my undergraduate summers. The CCC did incredible, lasting work, ushered a generation of young men into adulthood, and serendipitously helped pre-position a nation for an inevitable world war. Forest ecology is a complex, interdependent network of relationships, geophysical weathering, and geochemical interactions. The carbon cycle is just one element of this extraordinary symphony of life. Insects, microorganisms, and non-flowering plants accomplish much of the carbon cycle’s essential processes. 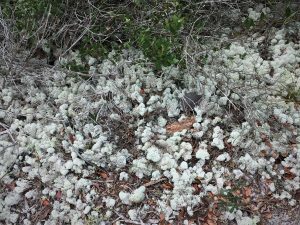 Among the most robust and ubiquitous non-flowering plants — the lichens. They aggressively and persistently seem to colonize every square inch of exposed tree bark and bare rock surface. The old saw, Nature abhors a vacuum, is not some flight of fancy. Instead, Nature establishes life wherever opportunity presents a niche to colonize. We see and admire the Mighty Oak, which I’ll refer to as charismatic mega-flora. Too many of us pay scant attention to the “lesser” flora. But “lesser” to what degree? There is nothing scant about what lichens, mosses, ferns, and algae contribute to ecosystem function. Again, no niche in Nature goes unoccupied. Remember, Nature disdains vacuums. Perhaps more accurately, Nature simply does not recognize a vacuum. Likewise, critters of many forms and function occupy select positions within the southern Appalachian ecosystem. Snakes, turtles, lizards are common across Cheaha and the Talladega. Same for mammals. I saw many deer and squirrels during our brief visit. Ah, if only I could soar over Cheaha and the Talladega like our feathered masters of the sky: hawks, eagles, or vultures! What a thrill it would be to soar above the state’s highest point. John Muir so beautifully observed, “When we try to pick out anything by itself, we find it hitched to everything else in the Universe.” And so it is with carbon and water — such richness of relationships within our southern forests. 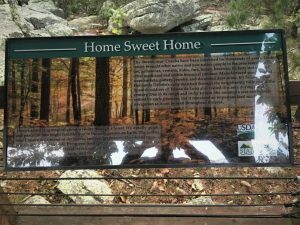 The Park’s signage makes clear that we have an obligation to responsibly tend our State Parks — to understand, appreciate, and enjoy these treasures. Aldo Leopold said with frustration 70 years ago in A Sand County Almanac, “All conservation of wildness is self-defeating, for to cherish we must see and fondle, and when enough have seen and fondled, there is no wilderness left to cherish.” Rather than view use (seeing and fondling) as inevitably synonymous with degradation, I hold firm that informed, responsible, and managed use can be accomplished without trace. I believe that we can use and cherish in a manner that retains equal quality and value for Park visitors of generations hence. 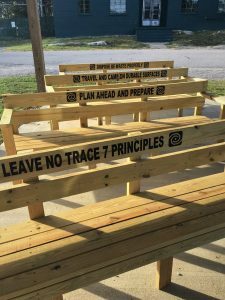 I like Cheaha’s Leave No Trace theme, including Big Foot’s role in spreading the message to kids of all ages! 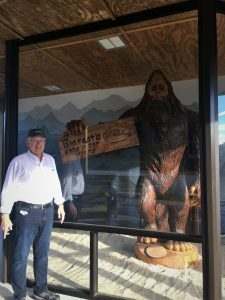 The outdoor seating (and messaging) below faces the Big Foot display case. The Park System recognizes that the best way to influence the future is through the eyes and awareness of today’s youth. 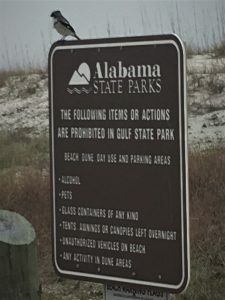 I applaud our Alabama State Parks for so effectively employing environmental education, a clear component of the Alabama State Parks’ mission: “To acquire and preserve natural areas; to develop, furnish, operate and maintain recreational facilities, and to extend the public’s knowledge of the state’s natural environment.” And one of the core Parks’ Goals: “To preserve unique natural features and integrity of state parks for future generations.” Extending knowledge and preserving natural features for future generations — the essence of leaving no trace and assuring that our natural heritage reaches seven generations hence… and beyond. The Cheaha signage is superlative. The 22-pearl State Park necklace is our treasure to pass forward and tend forever. I commend Park leadership for taking their trust responsibility seriously. Well done! Knowledge, wisdom, and appreciation fuel my own passion for Earth stewardship and aid in seeing and interpreting Nature’s guidance for life and living. 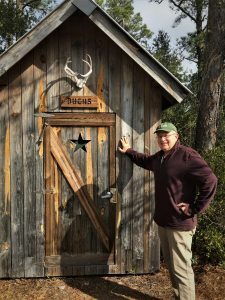 I am able to read and translate Nature’s language on the bases of: a lifelong love affair and intimate relationship with wildness; bachelors and doctoral level education, respectively, in forestry and applied ecology; and nearly four decades of applied research and practice in natural resources study and management. I bring my science knowledge and emotional embrace of Nature to bear in writing about Nature’s principles, tenets, and lessons. I’ve learned that Nature’s lessons often must pass through a filter to argue their case and make an indelible mark on the recipient… young and more senior. 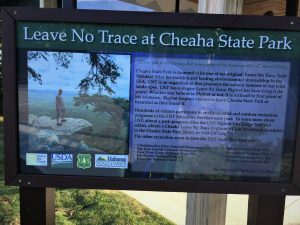 The Cheaha signage serves as that filter and spark… lighting the beacon of understanding, appreciation, respect, and responsibility. Subtle (and some not-so-subtle) education and awareness efforts can help Park users feel the Magic; sense the Wonder; embrace an Earth ethic; and pass the Torch. May Nature inspire all that you do!